On Sunday 4 December 2016, we started our Christmas series with elder Nikki Aben preaching on God the "Wonderful Counsellor". We also received Team Mexico home on 29 November 2016 and they were ready to share the testimonies on what God had done on their mission. 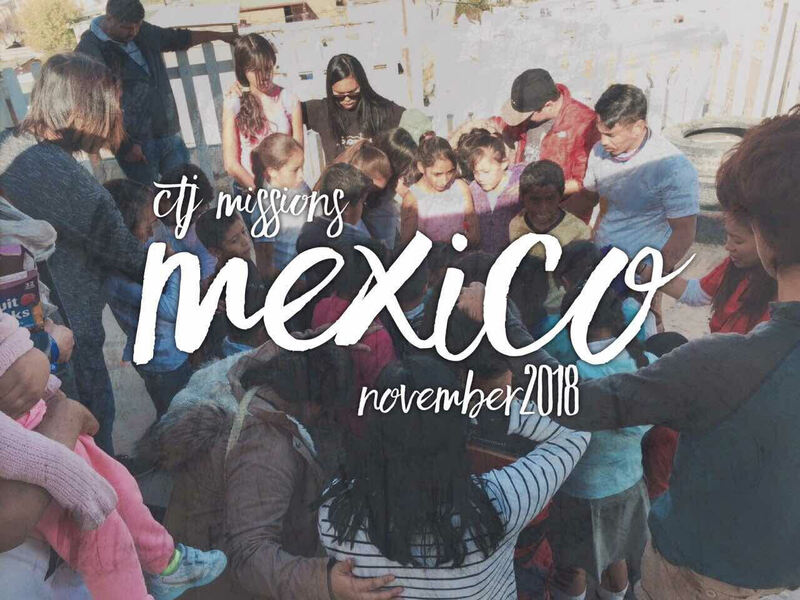 For 3 weeks the team had the privilege in partnering with Vino Nuevo Church - Vision Global where they worked together with local churches to evangelise and minister to orphaned children, youth, university students, down town city dwellers, indigenous Mexicans (Tarahumara people), rural churches, schools and children shelters. 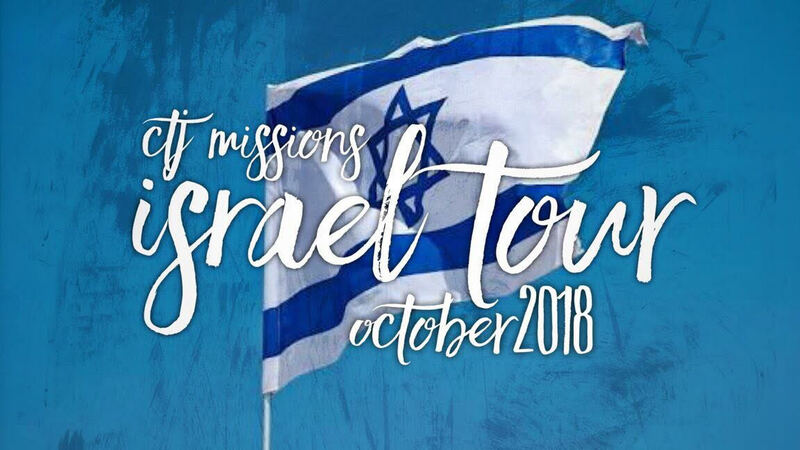 Given the reputation of this nation, God had not forgotten them as He led the team through the cities, farms, towns, and the La Sierra mountains to rural villages that even locals would not trek, just to show His love. 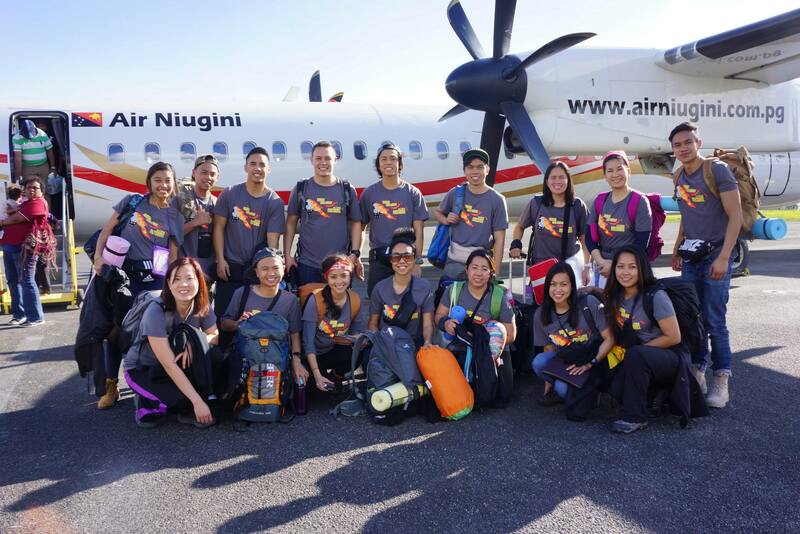 On Friday 23 September 2016, our Mission teams from PNG & India returned safely to Australia. 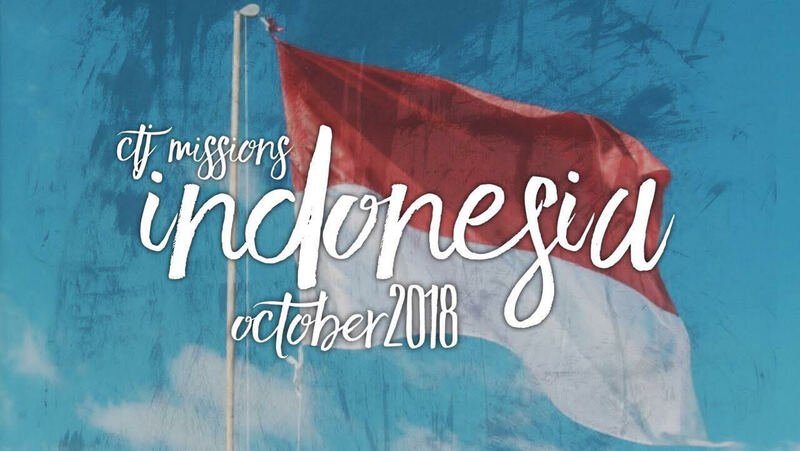 Last Sunday (2nd Oct), a couple of members from each team was able to testify in both Sunday services of what the Lord had done in each nation. We appreciate the prayers, donations and support from the church. The backpack donations were received with much gratitude. We cannot wait to upload the photos to show you all the joy in the hearts of the children & people in both nations. Stay tuned for further updates. 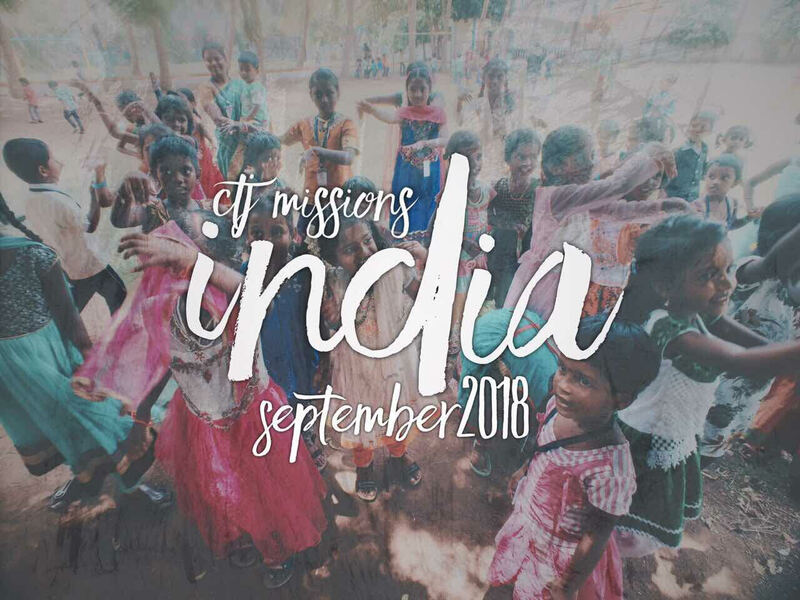 On 8th September 2016, our third Missions Team headed to India for a two week missions trip. Please continue to partner with them in prayer as they declare God's love over the nation of India. 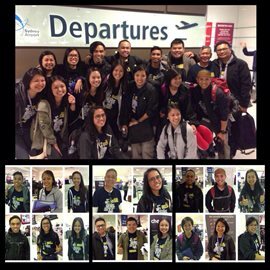 On Saturday 3 September 2016, our second Missions team departed to Papua New Guinea on a three week missions trip. Please continue to pray for them as they travel from village to village to minister the Word of God. On Sunday 28 August 2016, guest speaker Pastor Paul McCarthy joined us to minister on the topic of Prayer. During the service, Team PNG was released & prayed over before they fly to Papua New Guinea this Saturday 3 September 2016. Over the Thanksgiving weekend (30-31 July 2016), we were able to bless our local community & finish our 5 week Thanksgiving message series. 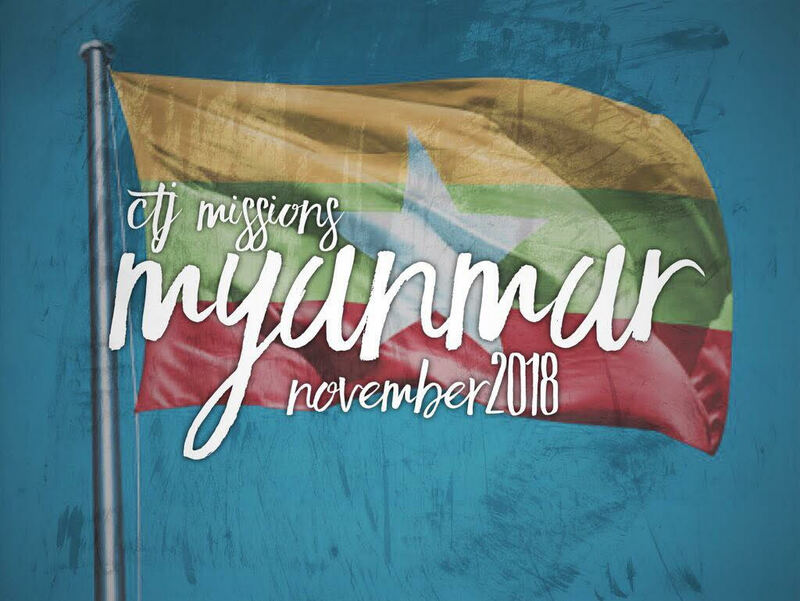 We celebrated with praise & worship, testimonies from our missions team who have returned recently from Nepal & a word from our Senior Pastor about giving thanks to God in ALL circumstances (1 Thess 5:18). Today, we continue to stand in gratitude for Who God is. On Sunday 3 July 2016, our first missions team for the year has embarked on their mission to Nepal for three weeks. The team returns on 24 July 2016 and will endeavour to report on their trip on the following Sunday service. In the mean time, we ask that you cover this team in prayer as they proclaim the Kingdom of God to the ends of the earth. Hope Hub held its first Puzzle Group on 3 July 2016. 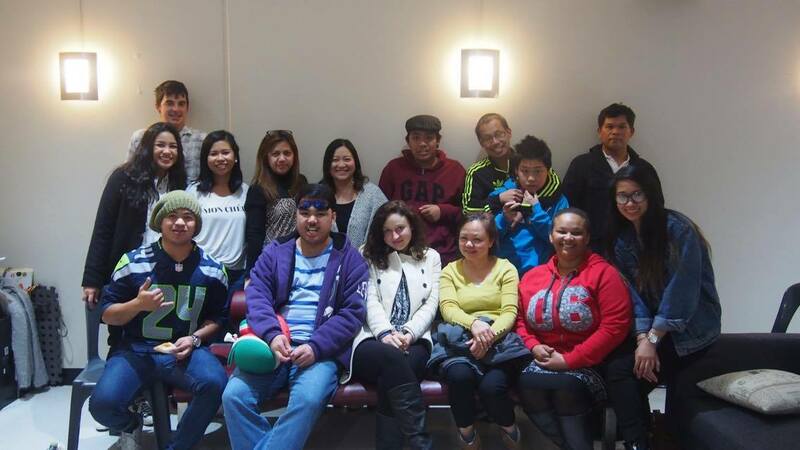 It was a time where families and individuals with special needs could gather and meet. The Puzzle group took on a "whole family" approach, where everyone was welcome and included. We discovered that when given the avenue, many of the families were more than willing to share their heart. Many spoke of the struggles and challenges, but also the blessings and milestones. 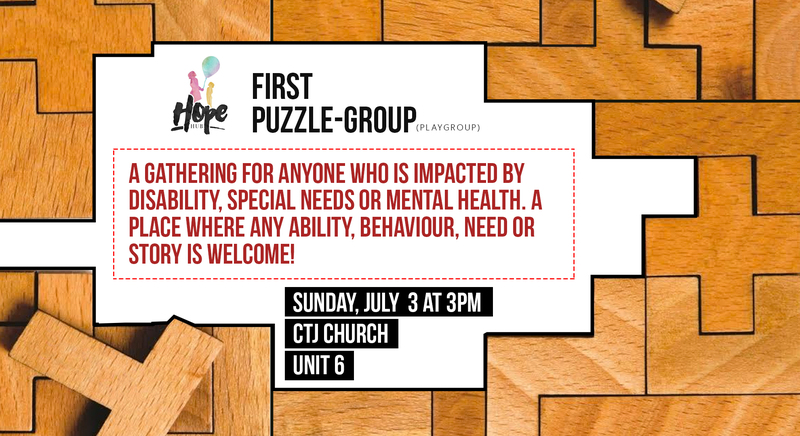 Hope Hub Puzzle groups will now be held on a regular basis - first Sunday of the month. We will keep you all updated on the details of the August Puzzle group. Thank you to everyone for their support. 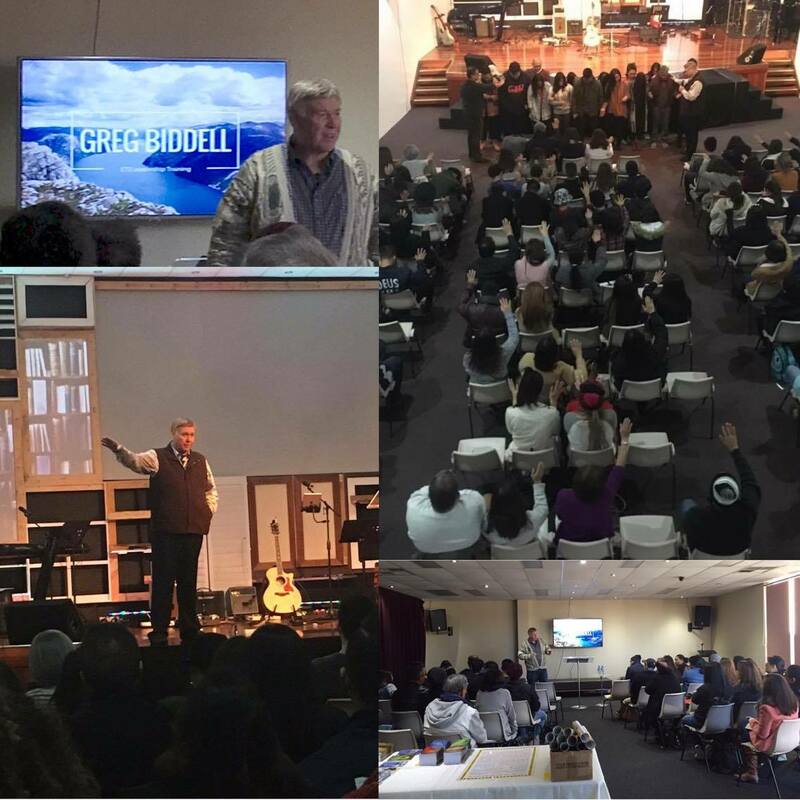 What a privilege having guest speaker, Pastor Greg Biddell minister on Sunday 26 June 2016 at our 8.30am & 11am services on the "God kind of health". He also conducted a seminar with the CTJ Leadership on excellence in ministry & perseverance. 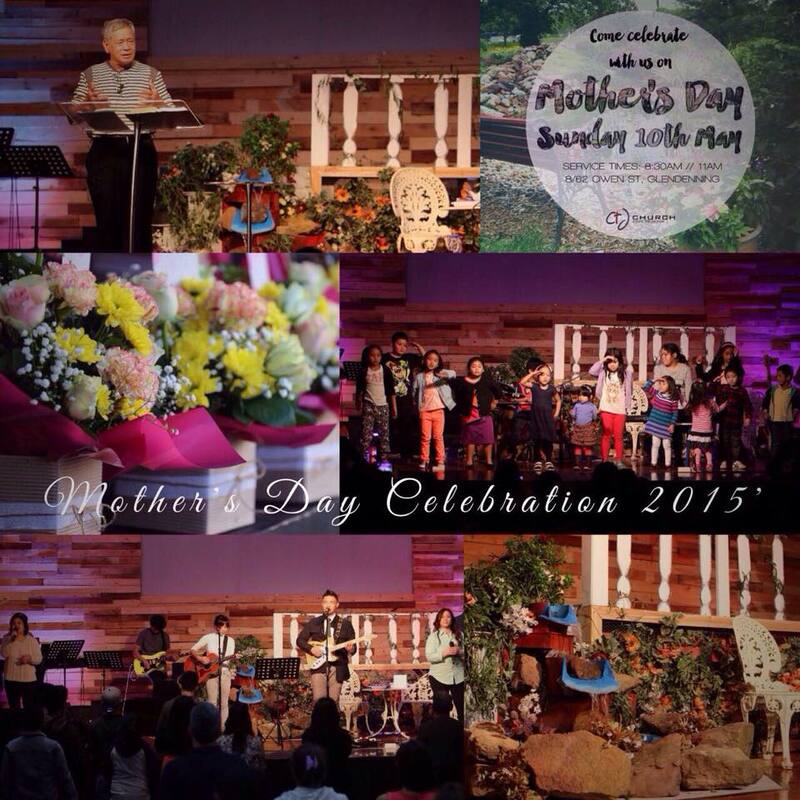 On 8 May 2016, our speaker Pastor Jeng Yap preached at our special Mother's Day service. She encouraged children to hold an inward attitude to not only esteem the person that our mother's are, but to also honour the position they hold in our lives. The theme of the service was "LEGACY". Our speaker encouraged the congregation to leave the following legacy behind: 1. Obedience, 2. Respect, 3. Honour. It was an opportunity to also welcome our new guests, pray for our mums, love on and encourage these leading ladies in our lives. Free brunch was served at 10am for all mothers in Unit 6 followed with a short program of performances by our Sunday School kids and various others. 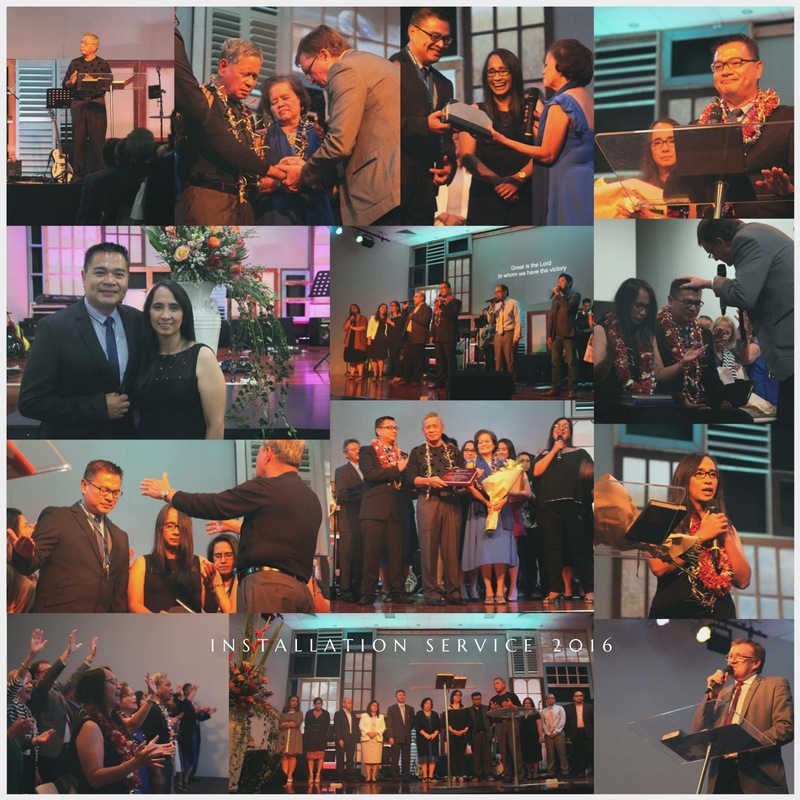 On Saturday 23 April 2016, Pastors Jim and Jeng Yap were installed into CTJ Church as the new Senior Pastors. The service included many visitors from various churches and the national Foursquare President, Pastor Wayne Magee & his wife Lorelle who were able to join us and pray for our old and new pastors. Although this installation is a change of leadership, this does not change the current direction or vision of the Church. Today, we get to continue what has already been established with the same heart and purpose worshipping the same God. 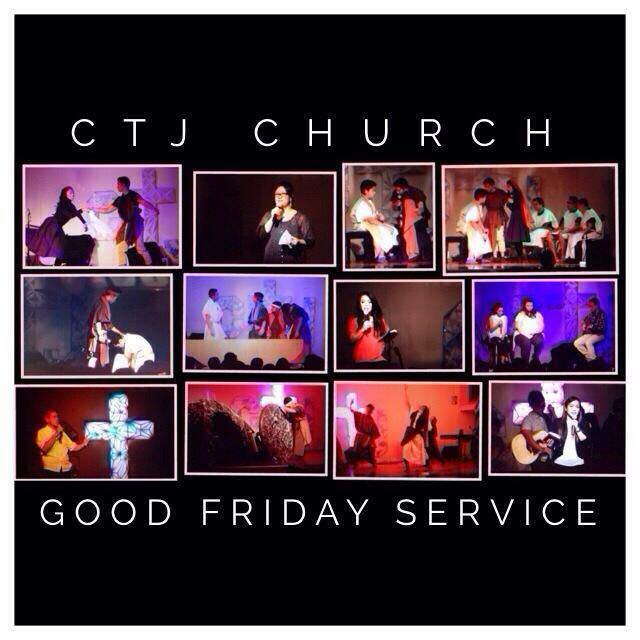 What a glorious Good Friday and Easter Sunday service held on 25 and 27 March 2016 at CTJ Church. Jesus paid the debt owed by mankind when He died on that cross by the shedding of His blood. It is finished! But, the good news is, He is risen! He is alive! 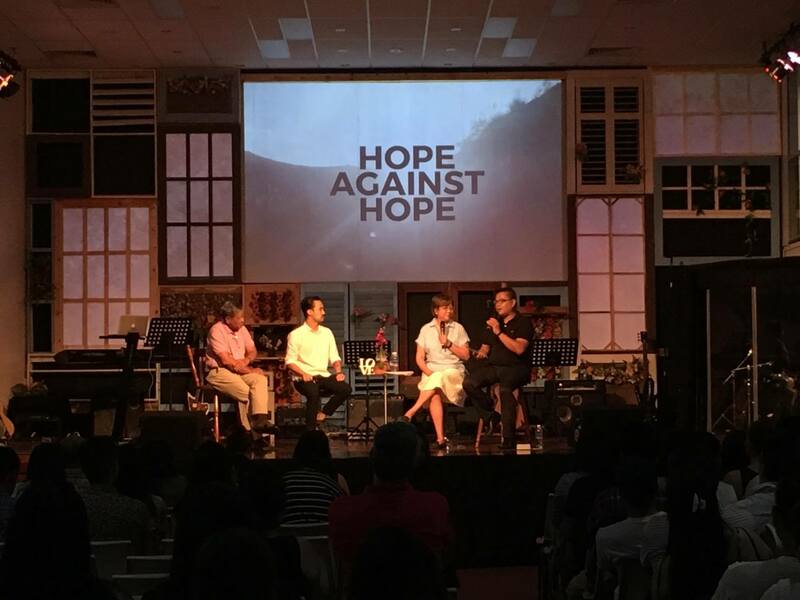 On Sunday 13 March 2016, Dr Rhima Gonzaga & Aaron Javier had the opportunity to present a christian perspective on Anxiety and Depression. With her professional and christian background, she stated "depression is not a choice, but hope is a choice". There are many who are clinically diagnosed or have genetically inherited this chemical imbalance which is beyond their control, but she believes there is always a choice to choose God. Aaron Javier was able to provide a personal testimony based on his diagnosis with depression due to genetics and hereditary factors. Based on his experience, he states for those suffering that it is best to find a GP that you trust, surround yourself with a supportive church community, have faith in God and make sure you talk about it (to a counsellor or your pastor). Pastor Ding was able to provide some pastoral insight based on scripture and had urged those suffering to make sure you talk to your family. In other cases, if you know anyone suffering, to be the ears to listen with sensitivity and not be judgmental. On Sunday 14th February 2016, we celebrated our 17th birth anniversary. 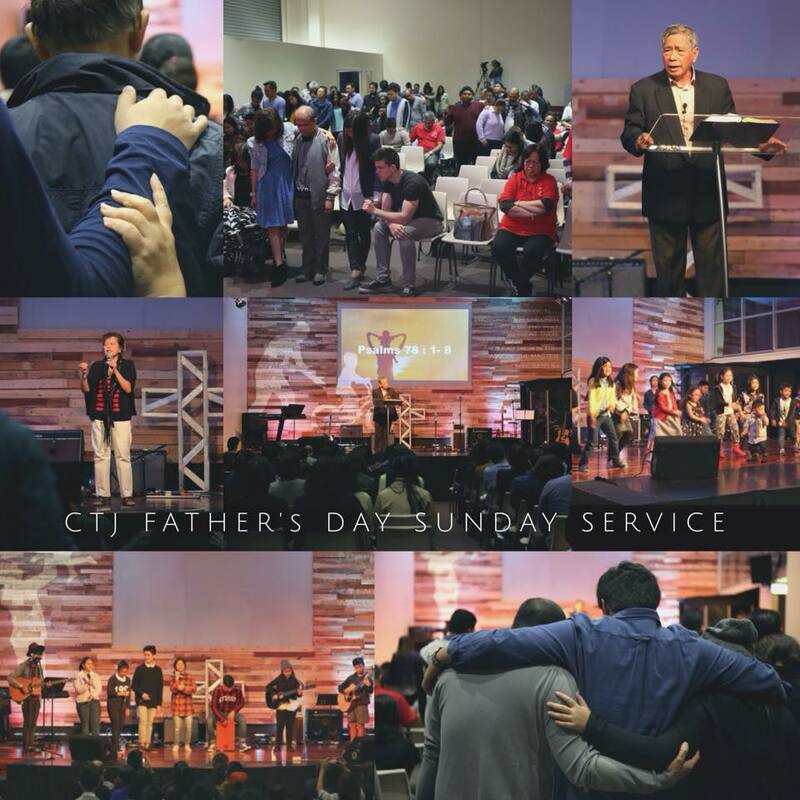 We thank God for where He has led CTJ Church; for His favour, faithfulness and goodness. We believe the BEST is still yet to come! Based on the verse - (Psalm 45:7) "You love justice and hate evil. 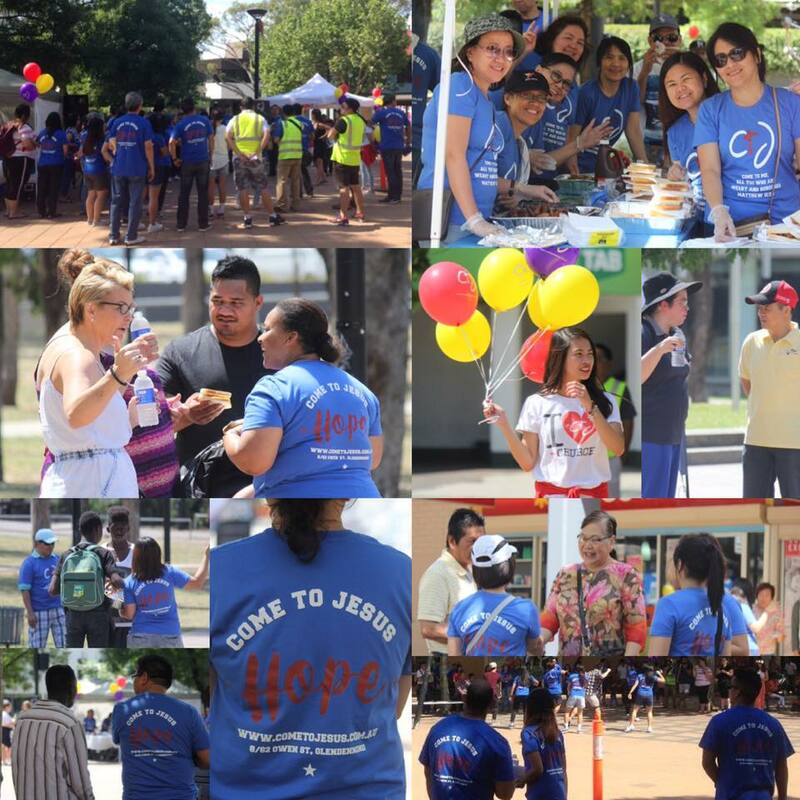 Therefore God, your God, has anointed you, pouring out the oil of joy on you more than on anyone"
On Saturday 17 October 2015, CTJ Church had the opportunity to evangelise and share the love of Jesus at Dawson Mall, Mount Druitt. Activities involved an evangelistic performance/drama, dances to promote the talents that God equips us with such as a flash mob, shared testimonies, conversations and free lunch (sausage sizzles & drinks). There were also kids activities and free printed balloons. It was a fruitful time displaying love in deeds and action to our local community. On Sunday 11 October 2015, we witnessed one powerful service as our Worship team led us into a new level & arena of worship. We also had guest speaker, Pastor Dong De Leon from West Sydney Community Church (WSCC) minister an encouraging word on prayer. Guest guitarist Maria-An & singer Jhoanna Aguila (former Voice contestant), performed her original single "Got the whole World". A brilliant performance acknowledging & giving God glory. Our very own Dance Ministry members also showcased the ministry with their excellent talent & performance. We praise God for all the raw talent, skills & heart displayed yesterday. We desire to give it all back to Him in service and delight. On Sunday 6th September, CTJ celebrated Fatherhood and thanked our God for being our abba father and loving us as His own children. We also honoured our biological fathers and our father figures. Pastor Josie Cantre, together with all of the church, prayed for all of our dad's and Pastor Ding shared a message on awarding a spiritual medal to all of our father's. We would like to thank Kidsworld for their wonderful performances; for rendering a song and a dance dedicated to our dad's, which I'm sure made them proud to watch. July is Thanksgiving month at CTJ Church. Every Sunday in July (8.30am & 11am) comprised of our Thanksgiving message series. Check out our Facebook page to view all of the photos. 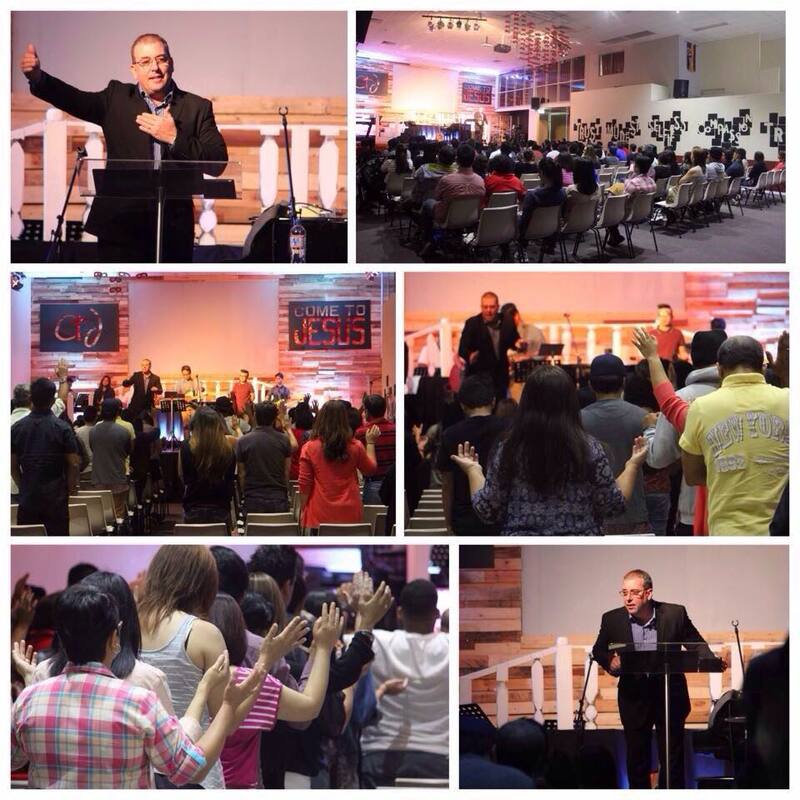 It was such a privilege to have a dynamic and passionate speaker, Ps Phillip Baker join us in our Sunday morning services on 31st May 2015. It was a powerful reminder that we all have a Kingdom assignment on this earth and that life is to be lived in hot pursuit of that assignment! Congratulations to those that have completed Class 101 and 201 on Saturday 31 May 2015. Class 101 is a session on discovering Church membership. This class is about WHO we are as a Church and WHAT we believe. Class 201 is based on spiritual maturity and focuses on the habit of reading the Word, Prayer, Tithing and Fellowship. Class 301 will be coming soon. Because these classes build on from each other, it is a prerequisite to complete Class 101 & 201. 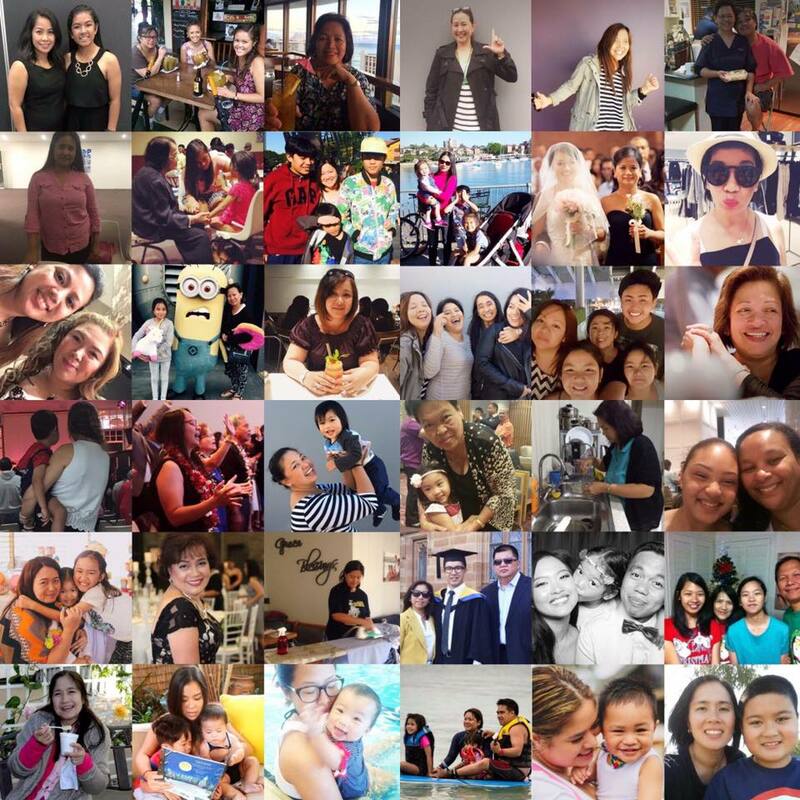 On 10 May 2015, CTJ honoured all mothers for all their love and sacrifice. Special numbers such as a song from Kidsworld and a wonderful performance by our Performing Arts Ministry was presented and beautiful flowers were sold on the day. Happy Mothers Day to all mums out there! 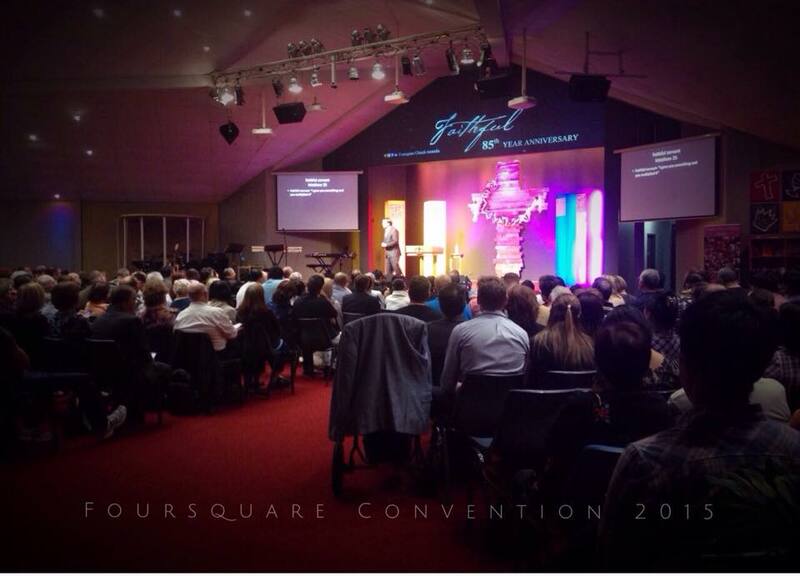 On 14-17 April 2015, CTJ took part in the Foursquare Convention, which was held at FCF Life Centre. 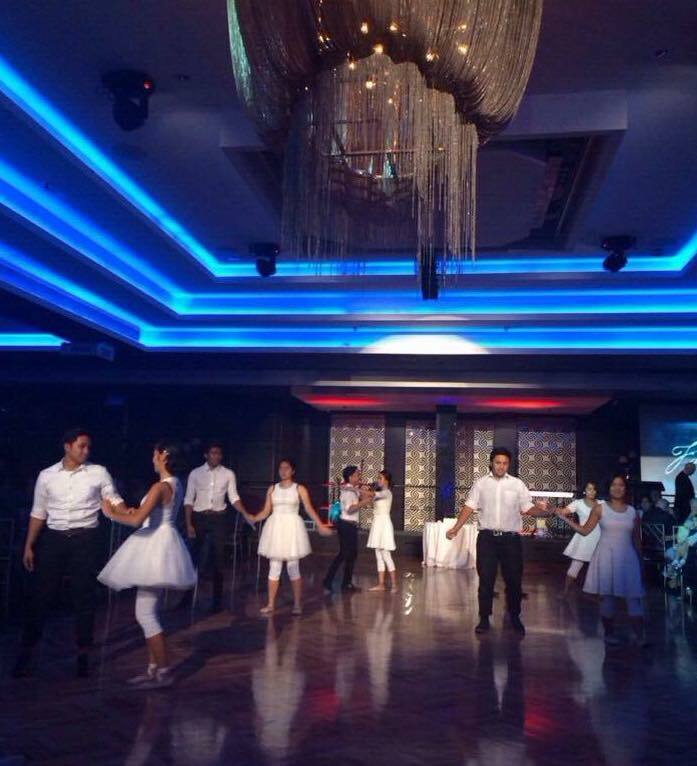 This year marked the 85 year anniversary and CTJ dancers were invited to dance at the Anniversary dinner. 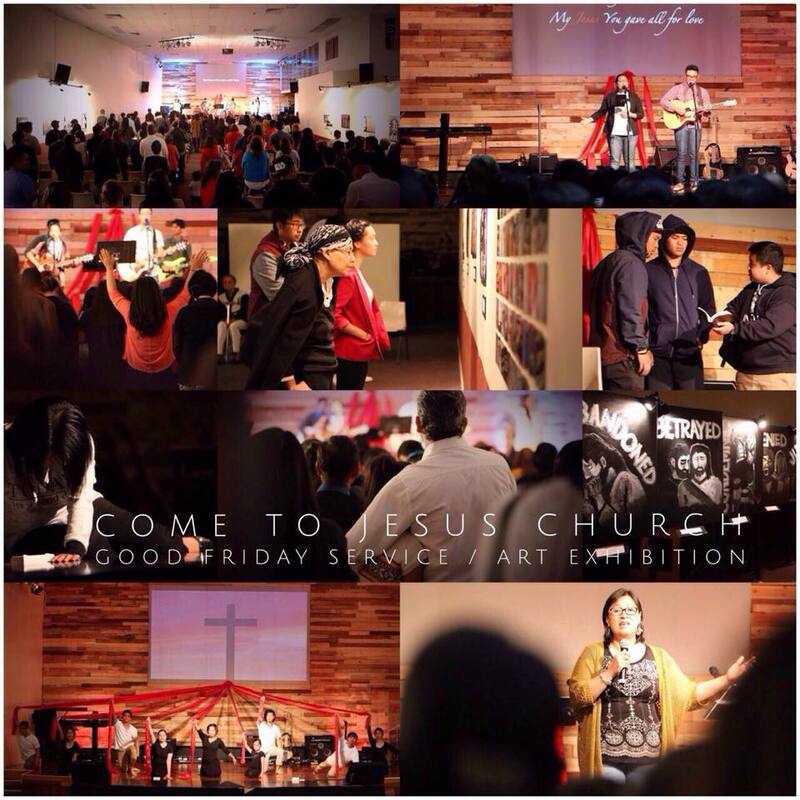 On 3 April 2015, we celebrated Easter which demonstrated the redemptive work of our Lord & Saviour Jesus Christ. A creative art gallery was displayed illustrating the life of Christ. 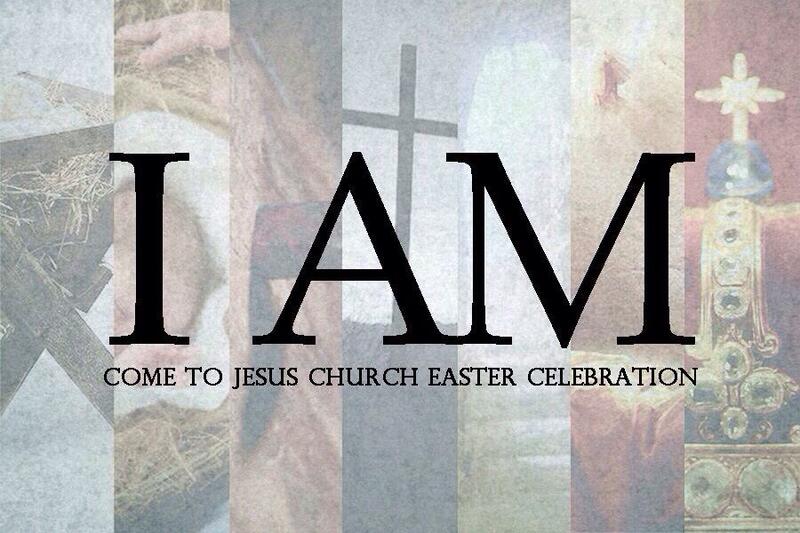 On 5 April 2015, we were reminded that the Lord defeated death by rising from the dead. The Good news is, He is risen. He is alive today and we serve a living and mighty God. On Sunday 8 March 2015, we had the opportunity to hear Dr Jerry Stott preach a powerful word on amplifying our voices and extending our tent so that we can house more souls for Jesus. Dr Jerry and his wife Julie Stott serve the Lord as Foursquare Missions International area missionaries in the South Pacific region. This is history in the making and we praise Jesus for the opportunity to grow, extend and enlarge our territory this 2015. On Sunday 1st March, we launched our first ever double service: 8.30am & 11am. We also opened our very own café, which has facilitated our fellowship time before, in-between and after services. As Pastor Ding preached, we are embracing the new season of opportunity and privilege! Read the CHANGES to some of our ministries by clicking on the image below. 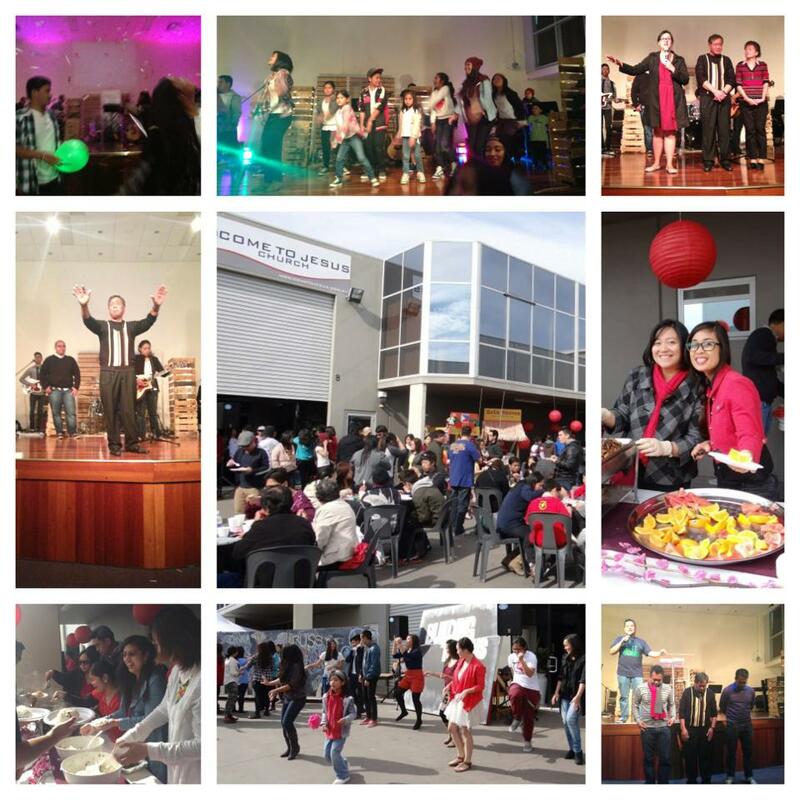 On Sunday 22 February 2015, CTJ Church celebrated its 16th Anniversary. All attendees were dressed in semi-formal attire to look presentable for the sweet 16 celebration for the coming of age for the church. The morning commenced with 8am pre-service with a host of activities and breakfast. An elegant on-stage staircase was constructed by the Creative Arts team, which created the ambience for a heartfelt masquerade illustrating a dance between an individual and God the Father. Pastor Ding spoke on "Jesus The Coming King", which is the fourth ministry of the four-fold ministries of Jesus based on our denomination (Foursquare Australia). Free lunch was served to all attendees and guests. 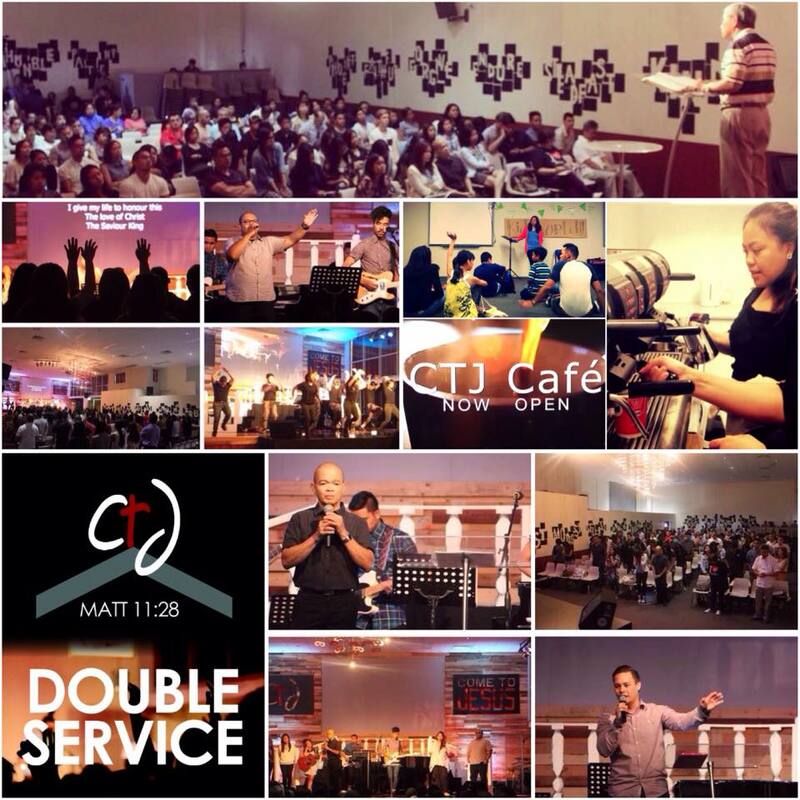 On the first Sunday of March, CTJ Church will be launching double services. Want to know how this will affect you? 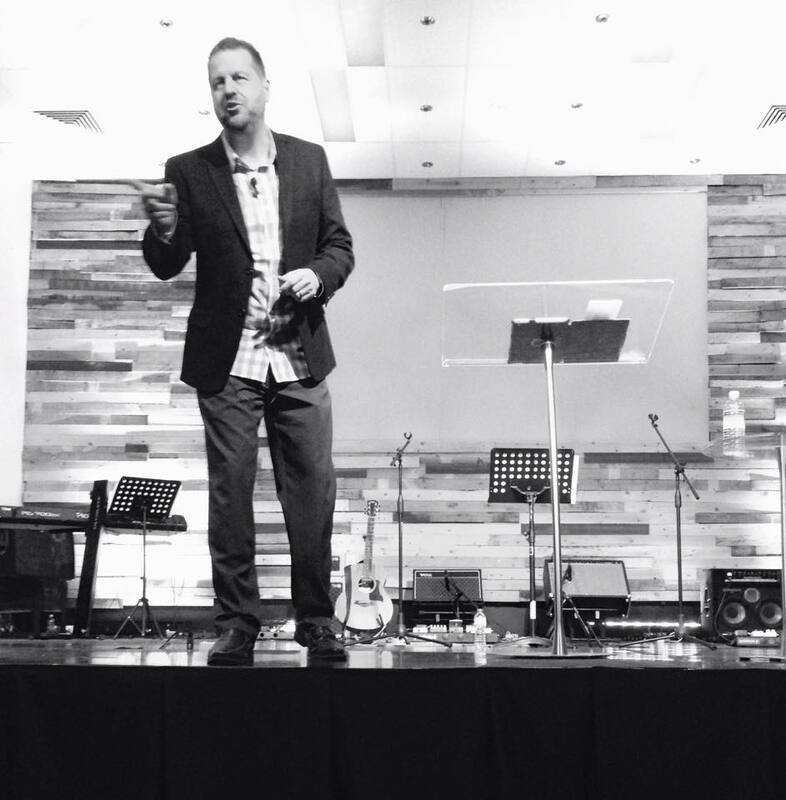 On Sunday 25 January 2015, Focus on the Family CEO, Brett Ryan preached at our 10am morning service on the importance of families and relationships. At 2pm that afternoon, he conducted a FREE family seminar called, Parenting Today. It was a fruitful discussion accompanied with an opportunity for Q & A at the end of the seminar. 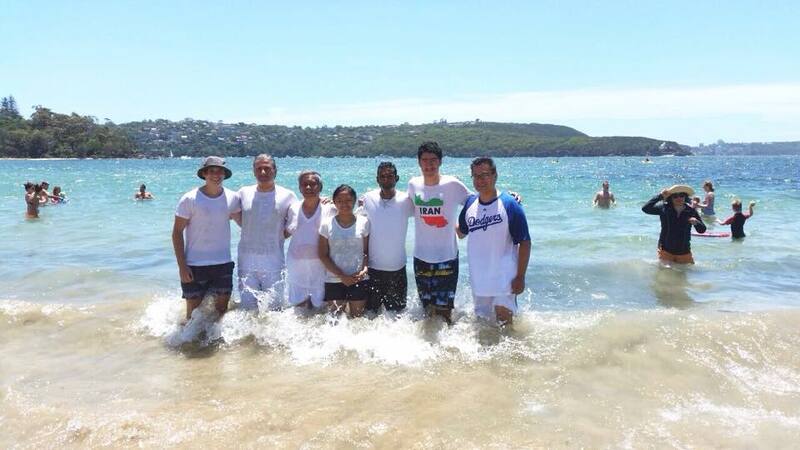 On Saturday 24 January 2015, five of our members were water baptized at Balmoral Beach as a public declaration of their faith. We would like to congratulate all who were baptized. We stand by you as you continue in your commitment and stand firm in your faith in Jesus Christ! 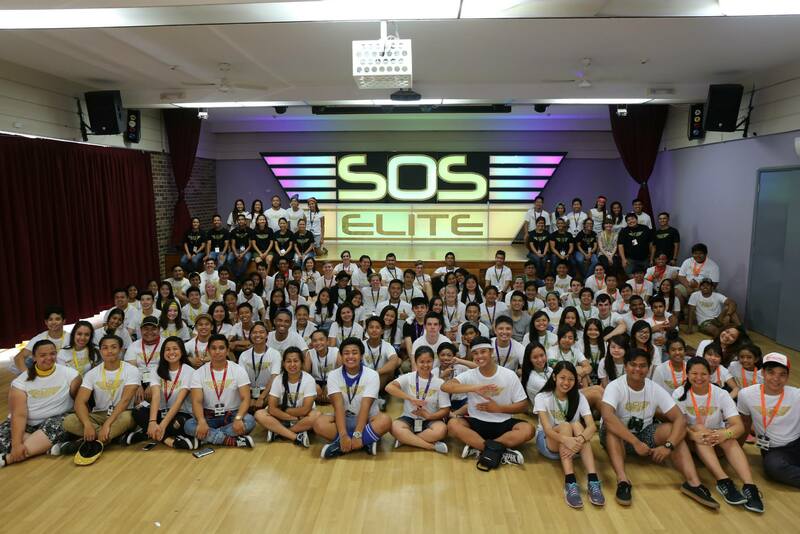 On 20-23 January 2015, our Young Adults ministry (RAISE) combined with our Youth Ministry (Generation FRESH) in their annual summer camp forming "SOS ELITE". Camp speaker, Kari Grant Campbell (Worship Director at Crossroads Master's Commission and Co-founder at No Compromise International) from Louisiana, USA was invited to minister the word in the sessions. The camp was held at Vision Valley with an atmosphere distinct from previous years. The six squadron teams were allocated with different praise names and were driven in their praise for Jesus. 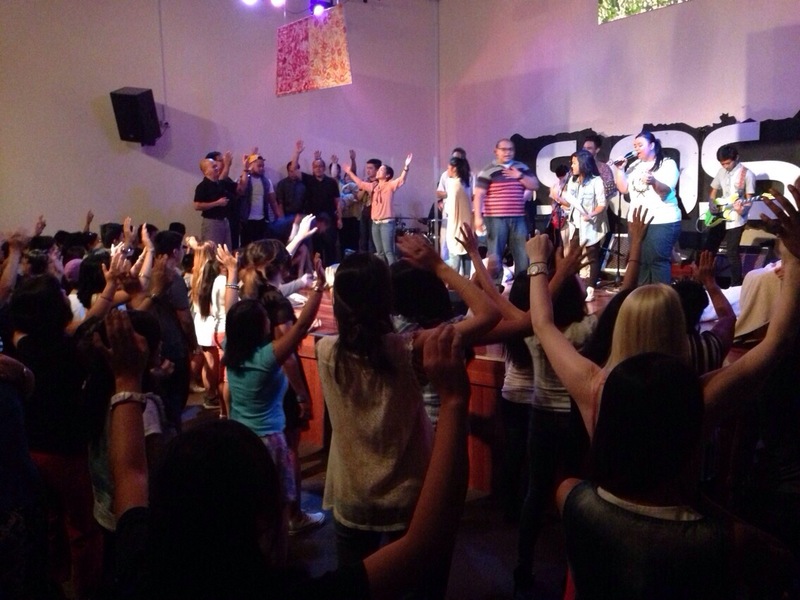 Camp attendees returned home with a greater love and need to worship God. 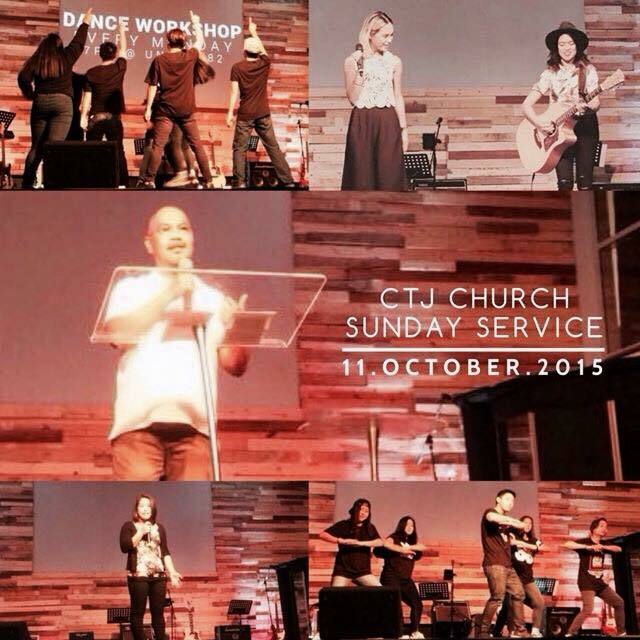 CTJ launched the first service of the year on January 11, 2015. 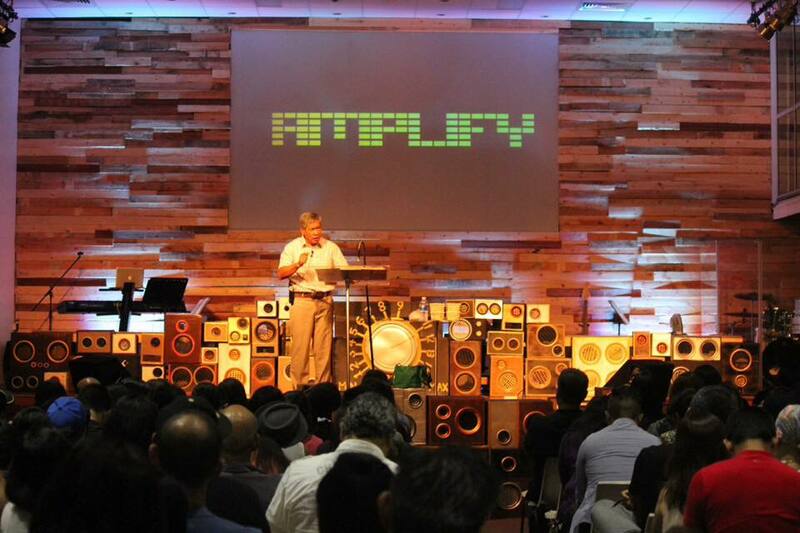 This is our year to AMPLIFY: make larger, greater, stronger, extend, enlarge and turn up the volume! 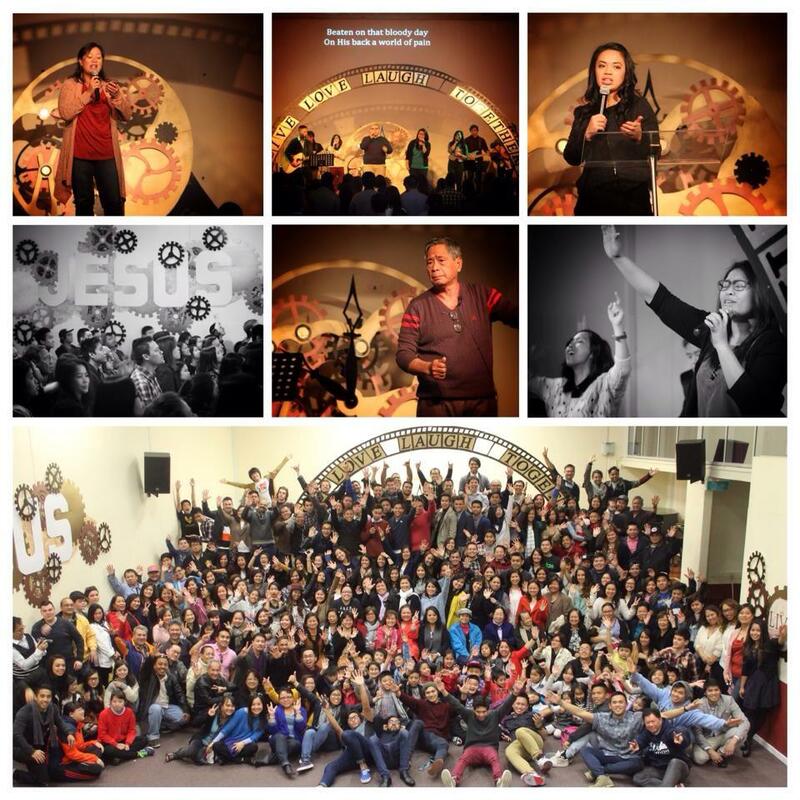 On Sunday 21 December 2014, CTJ celebrated and acknowledged the greatest gift of all... JESUS. Breakfast was served, the message delivered, several performances from various age groups presented to glorify God and the celebration ended with a feast and raffle tickets. 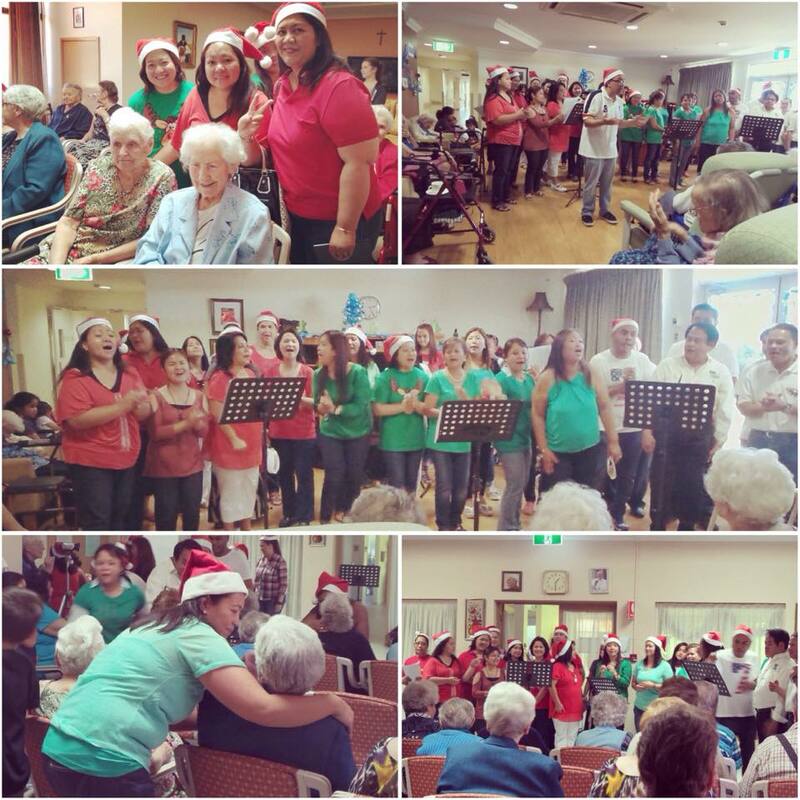 Community Impact - Nursing home visit - "Christmas carols"
On Sunday 14 December 2014, CTJ had the opportunity to bring Christmas cheer to two Nursing homes, St Elizabeth Home Aged Care in Dean Park, and The Manor in Minchinbury. Both facilities welcomed us with open arms accompanied with great joy, smiles and tears on their faces. Pastor Ding had the opportunity to share the Gospel, pray for the elderly and offer a prayer of accepting Jesus into their lives. It was a great opportunity to let them know they are loved and not forgotten. 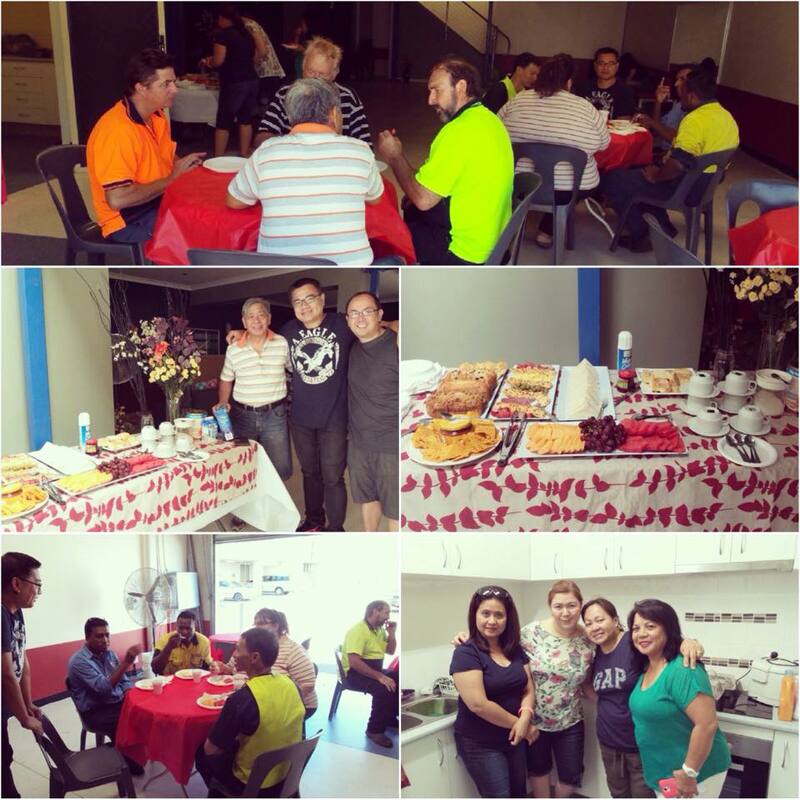 Community Impact initiative: "Hello Neighbour"
Community Impact ministry had the opportunity to serve morning Tea to our Church neighbours. It was a way of showing our love and appreciation for our neighbouring units. We had a good turn out and great conversations with those who came to sit and talk to us. For our neighbours who couldn't come due to busy schedules, we instead gave them a plate or two to share. 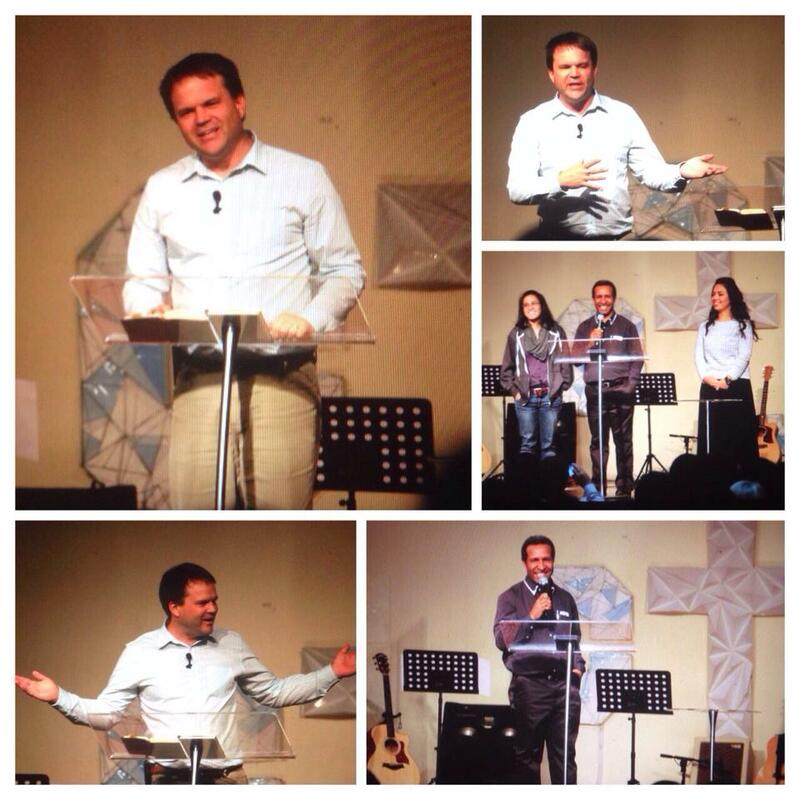 On Sunday 16 November 2014, Dr Roberto Regozo shared his testimony on healing and his walk with the Lord. Dr Regozo is a key medical practitioner and uses his medical knowledge and experience to minister to the Church body. His testimony firmly challenged those who are spiritually stagnant and gave hope to those who are seeking the Lord Jesus for healing. 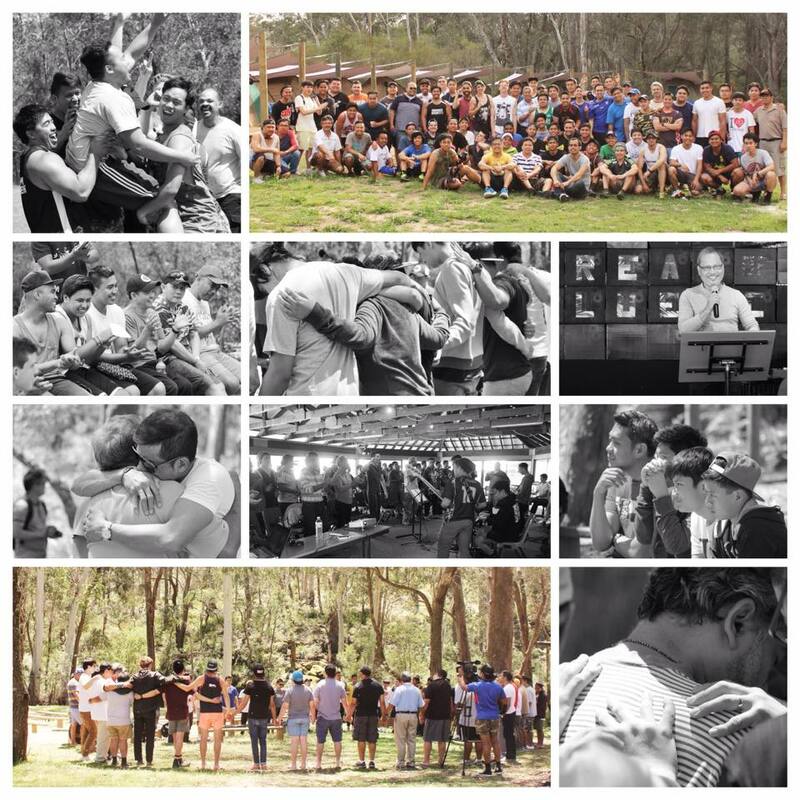 Men's camp 2014 - "Stream of Influence"
The men of CTJ had their annual camp from Friday 24 October - Sunday 26 October with over 70 registrants. The camp was held at Kirrikee Outdoor Education Centre, Penrose in Sydney's south. 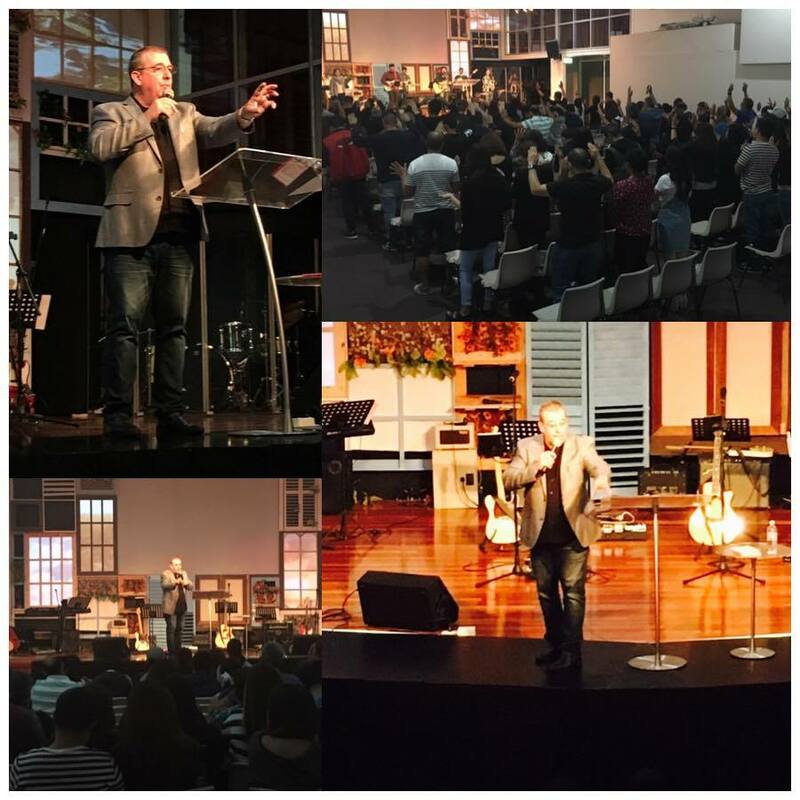 Guest speakers were Pastor Nomer Velasco (Vice President of the Foursquare Church Australia) and Pastor Rodel Palmer (Uniting Church in Quakers Hill). Ministry overseer, Edgar Delacruz says the camp was amazing, "God's hand on the steering wheel and everyone enjoyed the ride. Men reconnected and tapped to the ultimate stream of our influence, the Lord Jesus Christ." One attendee gave testament to the camp, Ferdie Villanueva, "Coming from a catholic background, I have never seen or experienced dealing with a great number of people with the same heart, passion and good character... It is very encouraging." 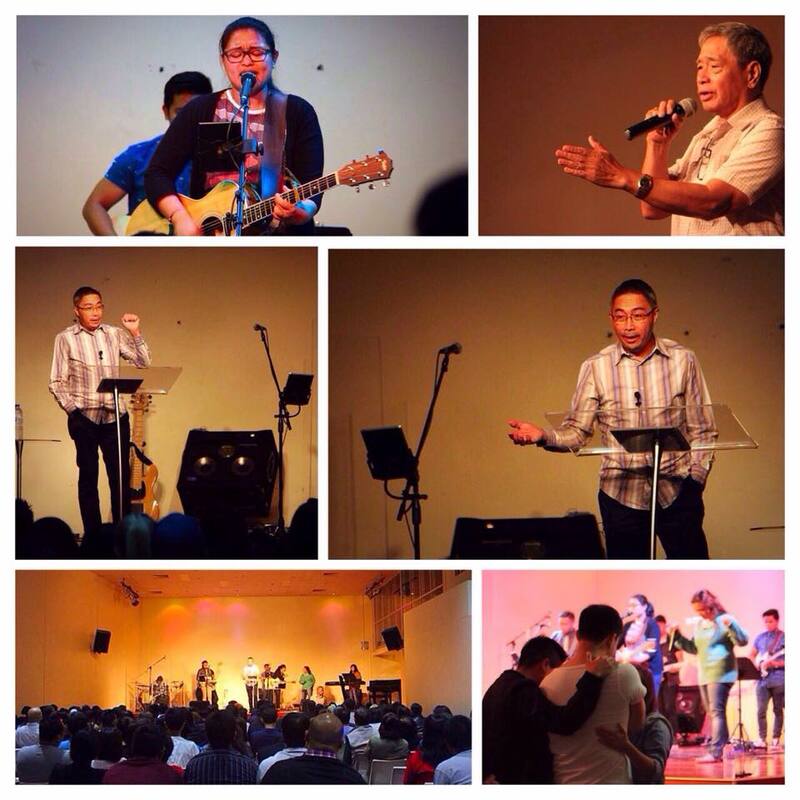 One of our very owns pastors, Pastor Jim Yap had testified, "My take home... Spiritual maturity is not about reaching the end of our destiny, but a tap of the Holy Spirit in our life to be an influence to others." At our Sunday Service this morning, Colombia Team 2 returned from their three week missions trip to testify of the Lord's goodness. 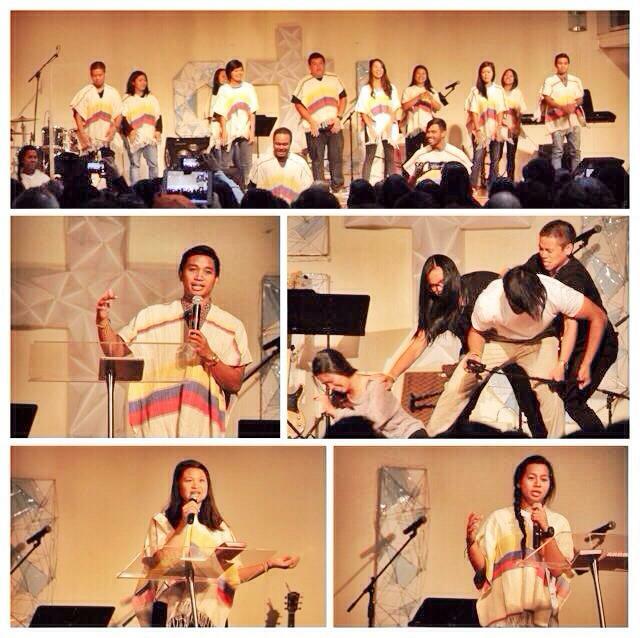 The team had the opportunity to share testimonies of what the Lord had done during their time in Colombia. 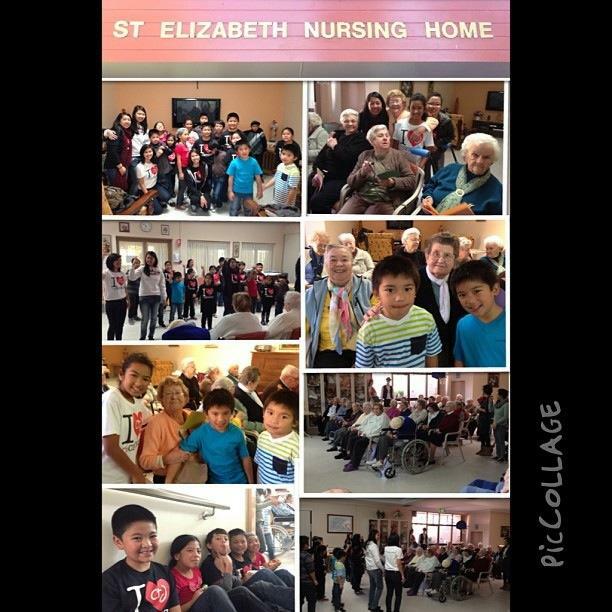 "God prophesied, and the team DECLARED God's goodness & glory"
On Sunday 28 September 2014, our Community Impact team and Colombia missions team (team 1) visited St Elizabeth Home Aged Care Facility in Dean Park from 1:30PM onwards. 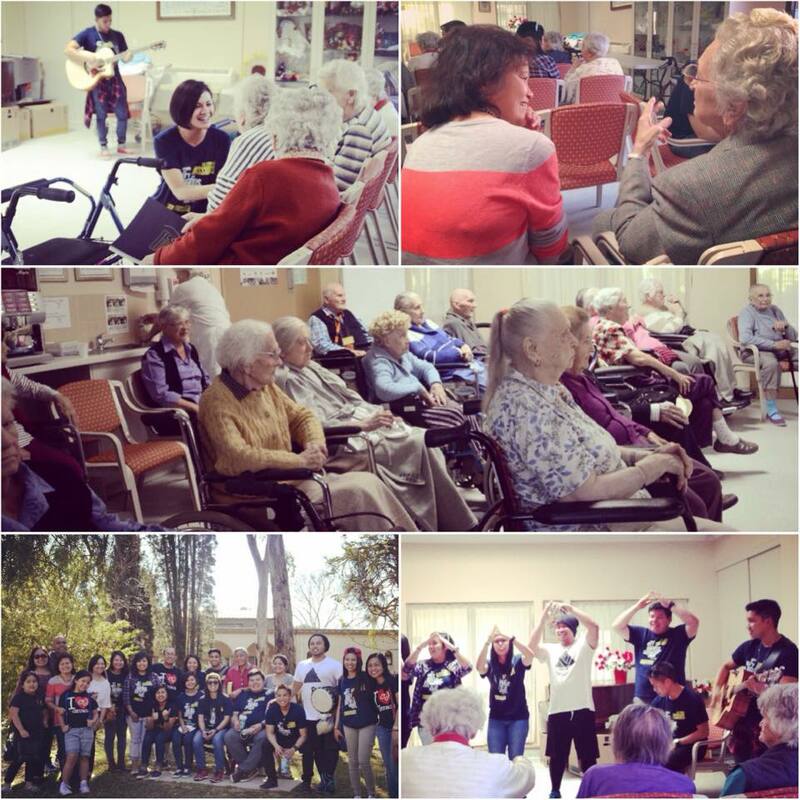 The team ministered and facilitated a program through songs, drama, dances, the word of God and spent one-on-one time with the elderly. 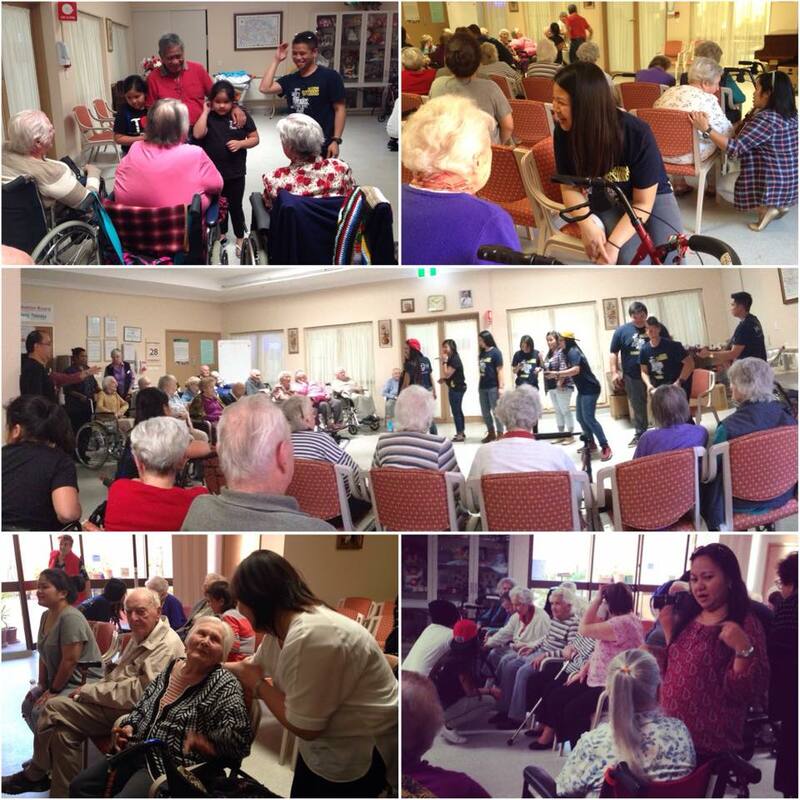 An elderly gentlemen quoted that they do not get much visitors at the Aged Care Facility. But it was a joy to see their faces light up as the church demonstrated love in action, through listening, sharing and showing they care. As a Community Impact initiative, the Community Impact team and our PNG missions team will be visiting again next month to remind the elderly that they are loved and not forgotten. 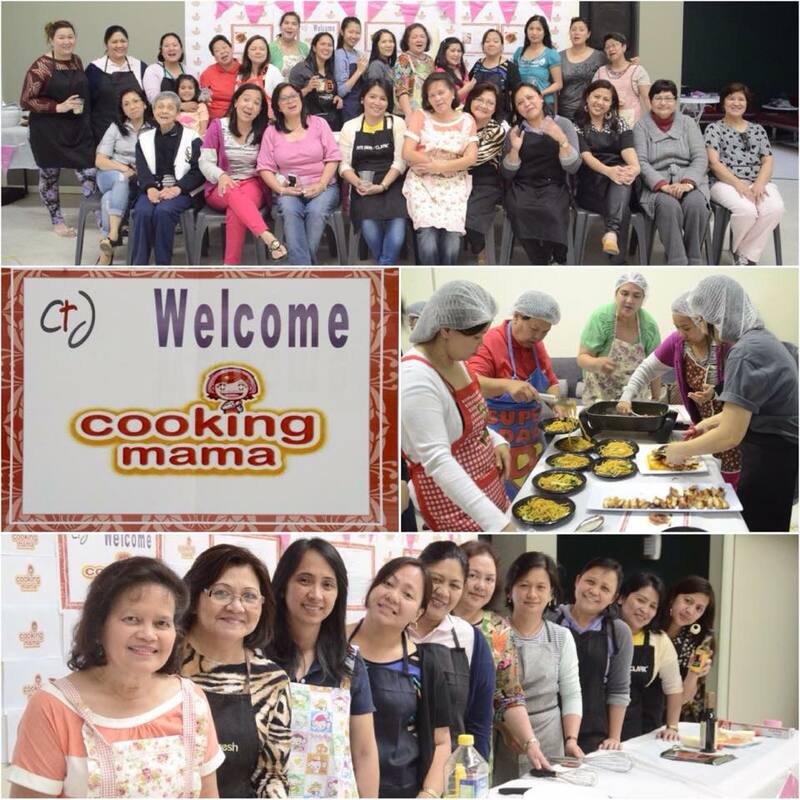 On Saturday 27 September 2014, our JEWELS ladies ministry facilitated an event called "Cooking Mama". Dressed in their Saturday's best aprons and hair nets, the morning cooking session commenced at 10am and catered to women of all ages. It was a practical lesson on cooking and a time of fellowship. The ladies prepared sushi with salmon, teriyaki chicken, noodles as well as taho. 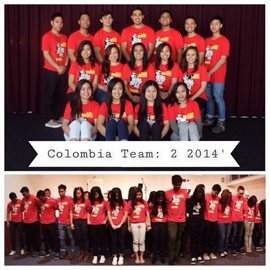 Our third and final missions team for 2014 flew on 17 September 2014 to make an IMPACT in the mission field of Colombia. We thank you for your constant prayer and support throughout the process! We eagerly wait for their return and testimonials on how the Lord moved! Congratulations to our CTJ Bowling Team for winning 2nd place at yesterday's tournament amongst 18 churches, rising from 16th place. They have won $3K which will now be channeled as a missions offering to one of the churches in the Philippines. 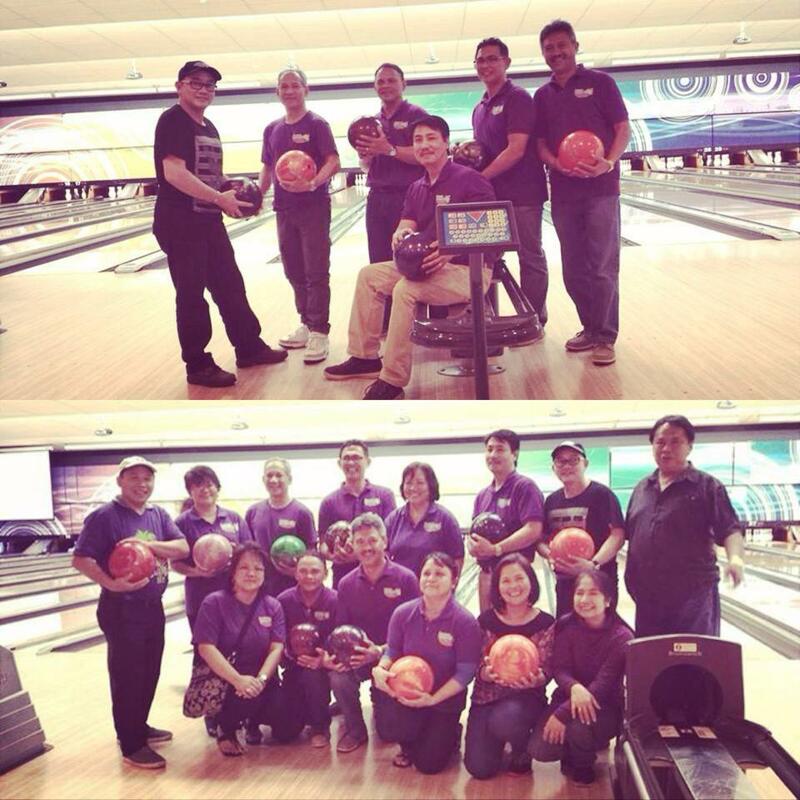 The bowling team includes Sergs Mesina, Joey Escarilla, Joey Magtibay, Roland Laurel, Julio Magtibay and Vher Quiaem. 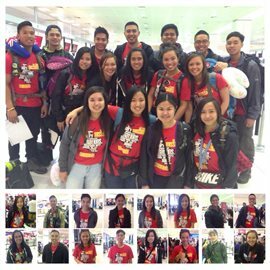 On 9 August 2014, CTJ Church released 17 voluntary members to Papua New Guinea for a three week missions trip. The team moved from village to village with minimal access to running water and electricity to minister the gospel. The main areas the team visited included Fore (highlands), Bogia (north coast), Serang, Riwo and the city of Madang. They returned and landed safely back in Australia on Friday 29 August 2014. On Sunday 31 August, our CTJ Church morning service was dedicated to watching the dramas, dances, a video and hearing the testimonies of what the Lord had done. 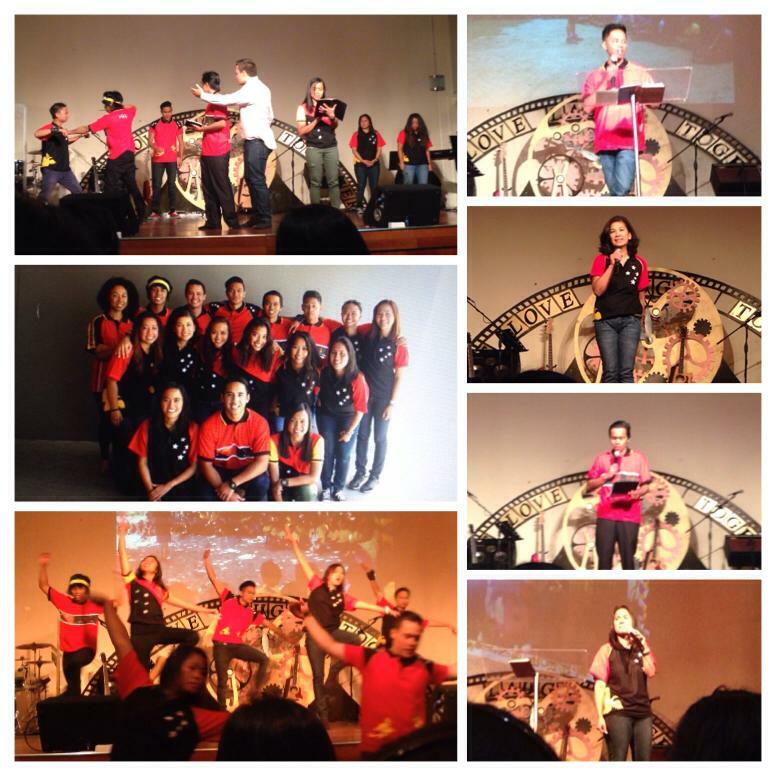 It was not a showcase of talent, but a service to give God all the glory. Lenie shared on how God was able to use her weaknesses, Darren preached on how Jesus is calling us out of our comfort zones, Robi testified on how the Lord challenged him and Chet concluded on how God was able to restore her and offers the same restoration to all people. 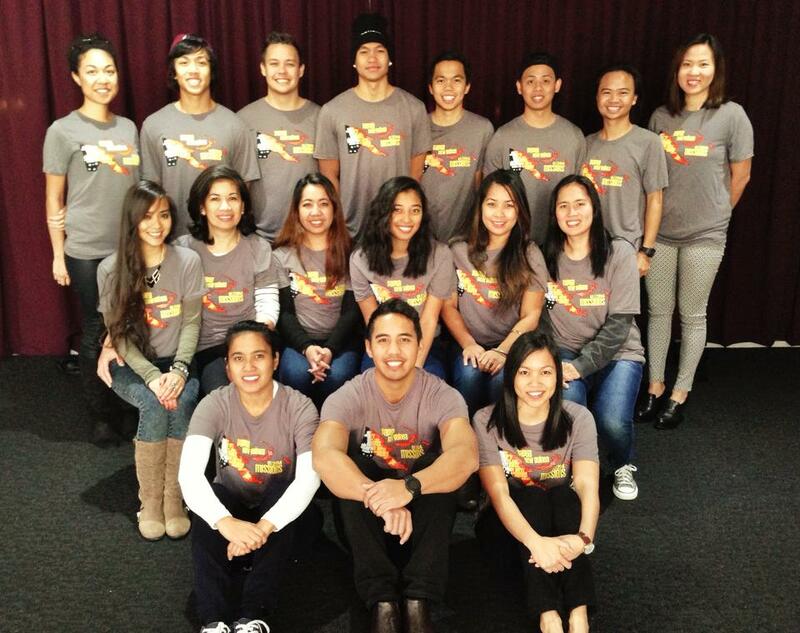 On 9 August 2014, a team of 17 CTJ members will be flying to Papua New Guinea for a missions trip. The trip will be for a duration of three weeks, starting from 9 August - 29 August 2014. 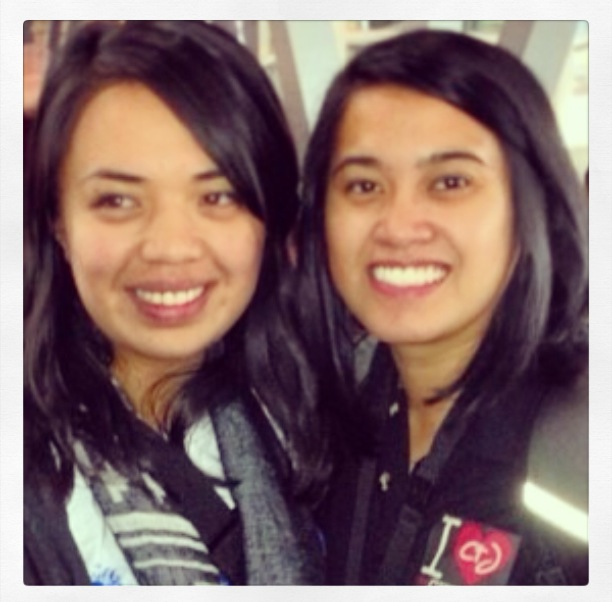 Please pray for them as they journey to foreign territory to spread the gospel message of Jesus. 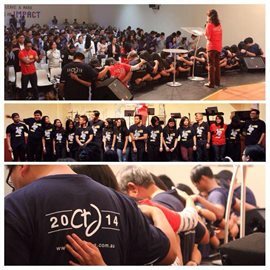 CTJ Thanksgiving 2014 was held on Friday 25th July - Sunday 27th July 2014. It was a wonderful and eventful weekend for CTJ as we dedicated all of our efforts and praise back to our Saviour Jesus for what He has done for CTJ! 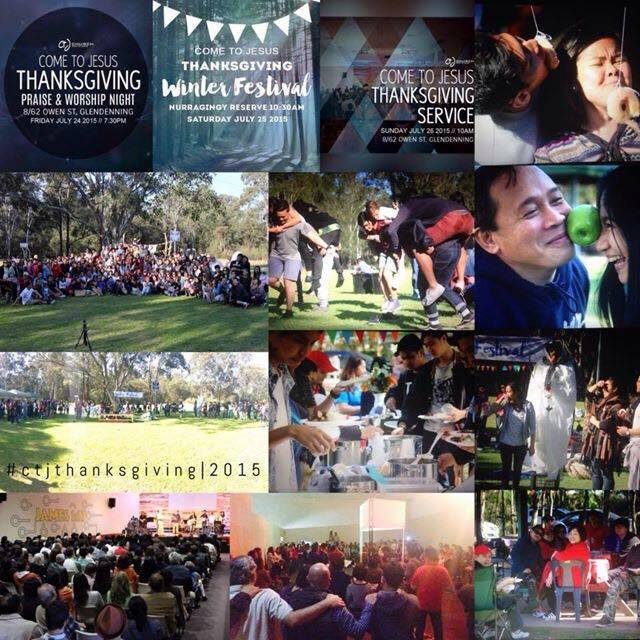 Check out our official hashtag #CTJthanksgiving2014 to view a stream of photos/posts from our members and guests. 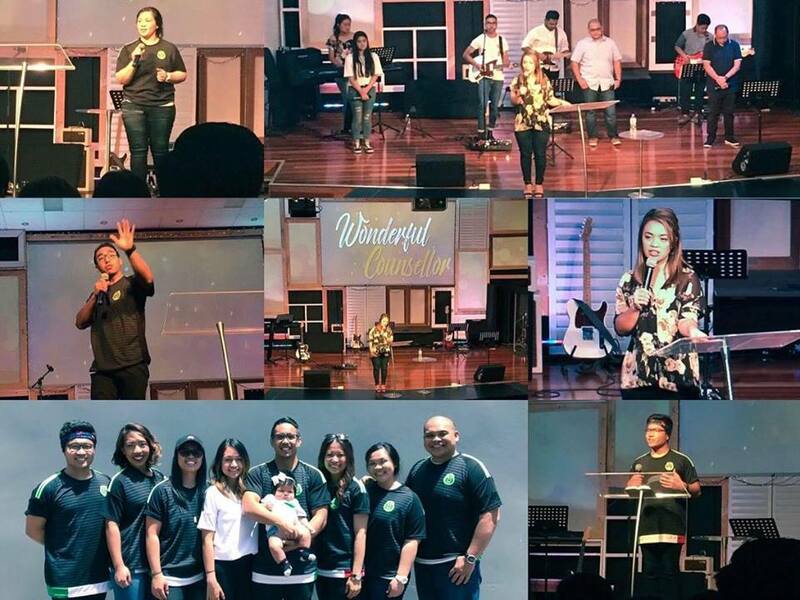 This night showcased the various ministries that CTJ Church is composed of with each ministry having the opportunity to be showcased briefly on stage. Good news from our Worship Ministry; they were able to release their first song entitled, Collide, which was written and composed by the band with the help of Kari Grant Campbell. A fellowship dinner was prepared by our very own Food Ministry. The dinner comprised of a delicious 3 course meal which included minestrone soup and bread, delicious butter chicken, creamy fruit salad. The evening show was emceed by our comedic duo Jonah Naguit and Alex Jacobi and included entertainment, singing, games, live guests, a lip sync battle, and special performances from our Dance ministry and Kidsworld just to name a few. It was a night full of laughter and entertainment and evidence enough that church life is fun together. Pre-service began at 8am with a light breakfast and activities. The service commenced at 10am with our Senior Pastor Ding teaching from the word of God followed by a light lunch. The evening concluded with a CTJ Church family photo. 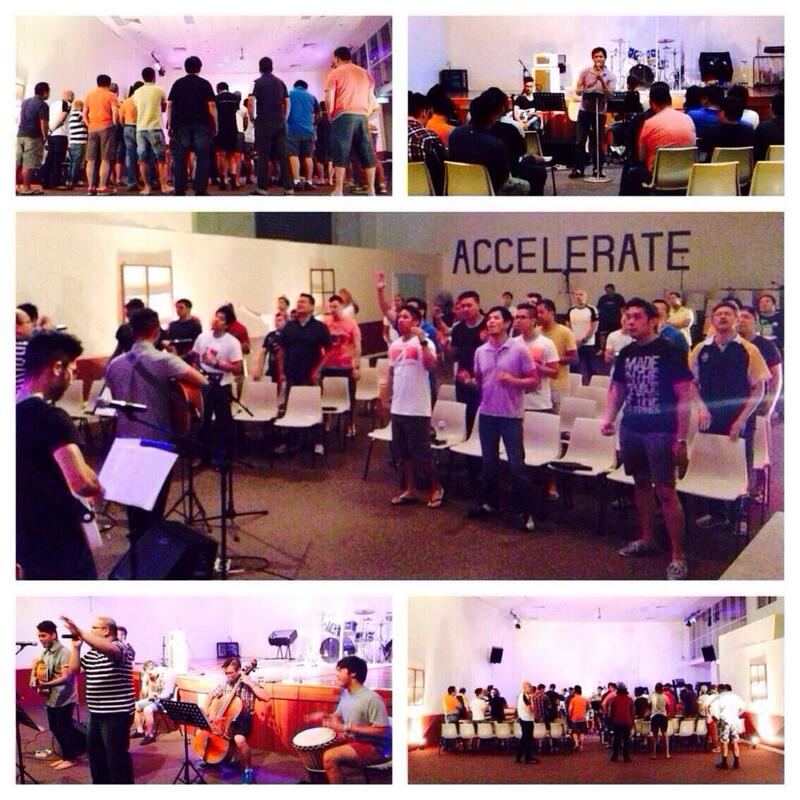 On Sunday evening (22nd June 2014), CTJ men rallied together for an open forum. 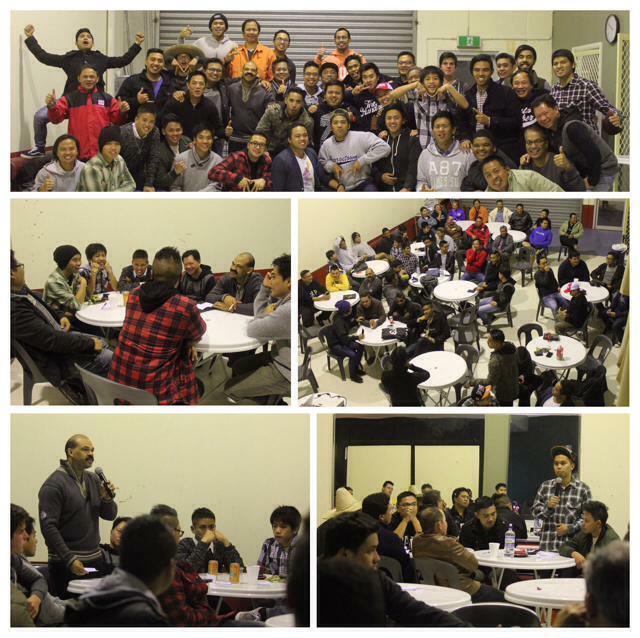 It was an opportunity for all men of CTJ regardless of age, to gather, rally and fellowship with one another. On Sunday 22 June 2014, CTJ was privileged to have Worship Director, Kari Grant Campbell from Crossroads Master's Commission (Louisiana, U.S.A), join us in our Sunday morning Service to minister through song. She shared testimonies of God's goodness and ministered through songs written and composed by herself (and her students). 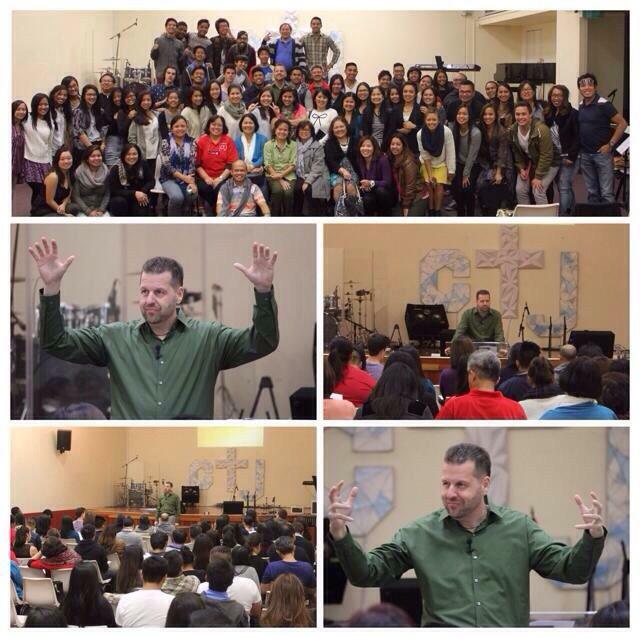 CTJ witnessed God move through the service as He touched many through this time of ministry. 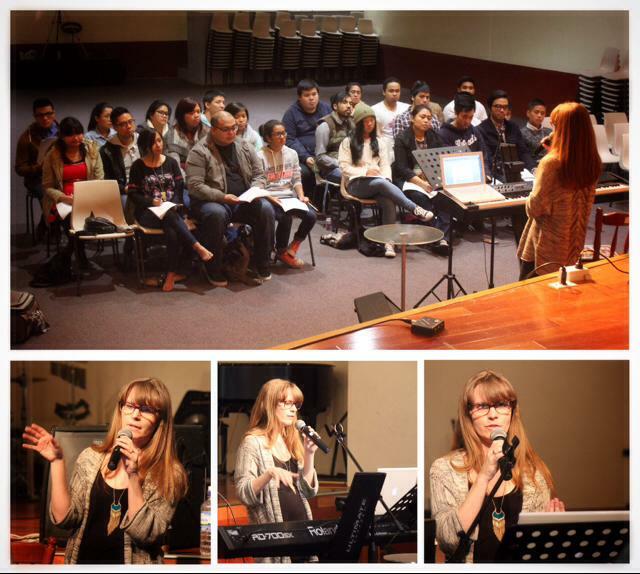 Later that afternoon, Kari hosted a workshop for those involved in the Worship ministry. 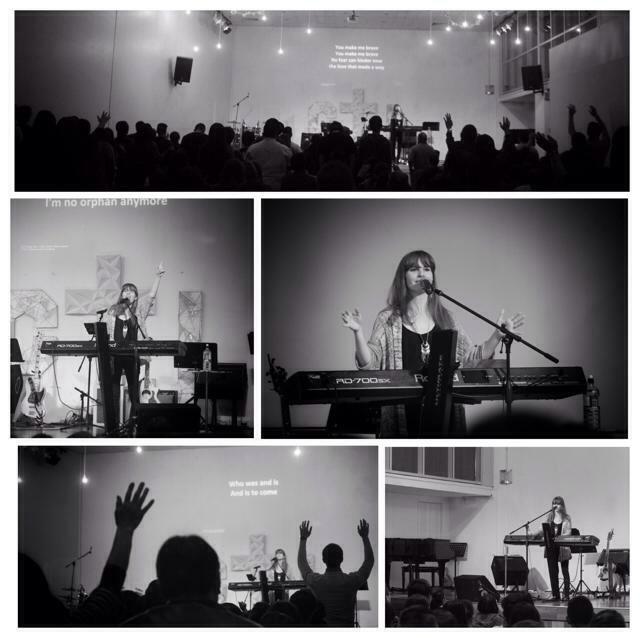 This involved learning more about the art of worship as well as the opportunity to write and compose a song. Thank you Kari for your time and investment in the CTJ worship ministry! 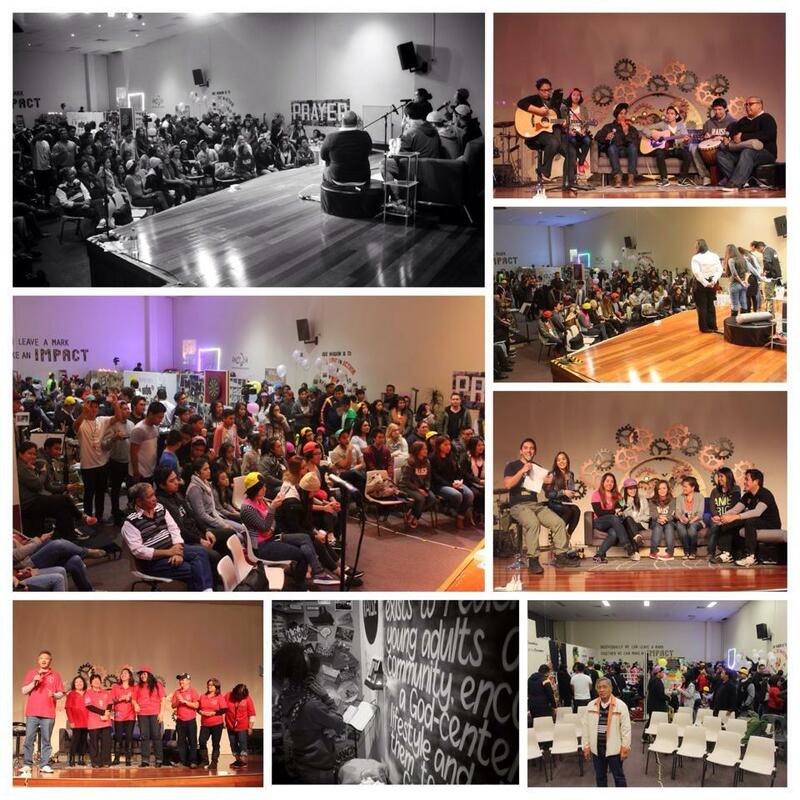 On Sunday 1 June 2014, Colombia team 1 hosted a Missions Service upon their arrival from Colombia. The team departed on May 8 and returned May 30, 2014. The service included a recap video of the team's trip, a hip hop dance involving all team members, a contemporary dance story and three testimonials from Jenny Villavert, Jeff Fuertes and Denise Hipolito. It was a powerful testimony of God's faithfulness! Check out our facebook page to view the team's photos of their trip. What a privilege to have Pastor Phillip Baker join us at our 10am morning service followed by an afternoon seminar on Precision Leadership. The Church witnessed the countless miracles and manifestations of healing take place in both services, including healed backs, elbows and shoulders to name a few. We would like to take this opportunity to thank Pastor Phillip for being an obedient vessel and allowing God to use him to make an impact in the lives of many. Glory to God for the healings! On Sunday 11 May 2014, CTJ had the opportunity to honour our maternal mother's, spiritual mum's and motherly figures. 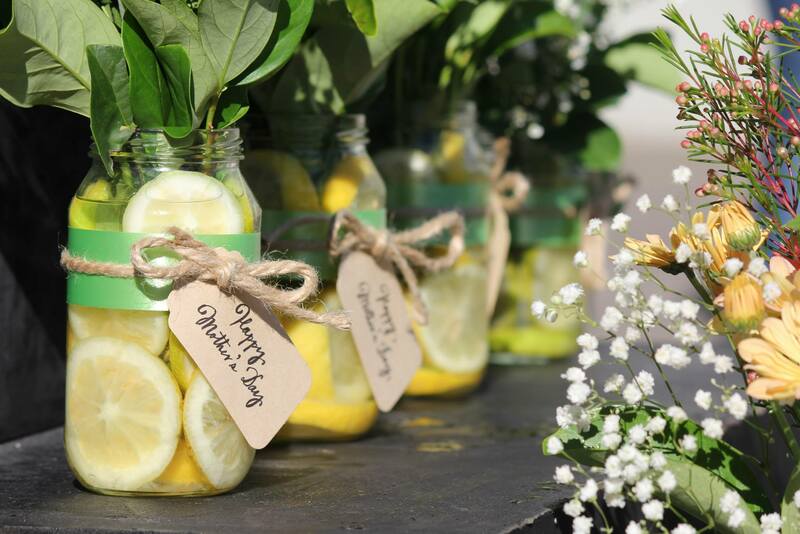 What a wonderful and lovely event filled with a delicious breakfast menu, creative flower stall arrangement and an encouraging word for all mother's. View our facebook page to see the full photo album. Enjoy the video below. On May 8, CTJ released 17 voluntary members of the church into the missionfield of Colombia for a duration of three weeks. They have the privilege of carrying the gospel message to another nation. Please continue to keep them in your prayers as they preach the gospel message on a global scale! We had the privilege of sharing the platform with Pastor Titus from the Solomon Islands as he welcomed back our missionaries. We also had the greatest privilege to hear Pastor Ted Vail share a word to the Church that we are a movement with a mission and that the very heart of missions is in the blood of our Foursquare family. 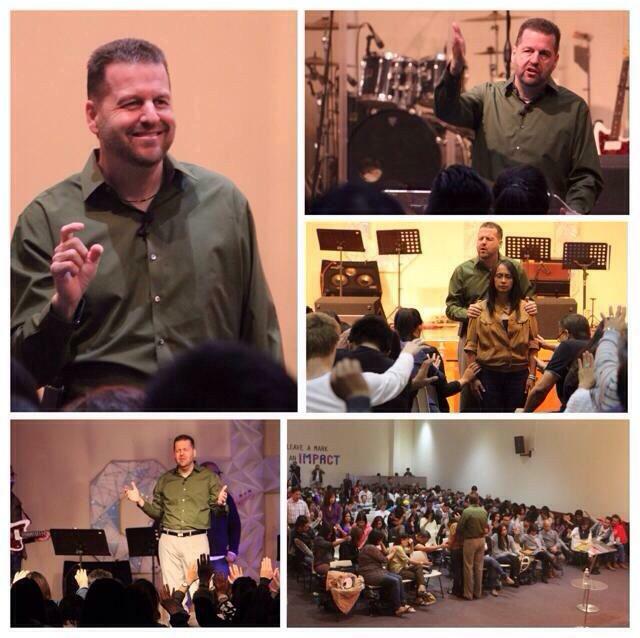 Pastor Ted is the Foursquare Missions International Regional Coordinator for North America and the Caribbean. 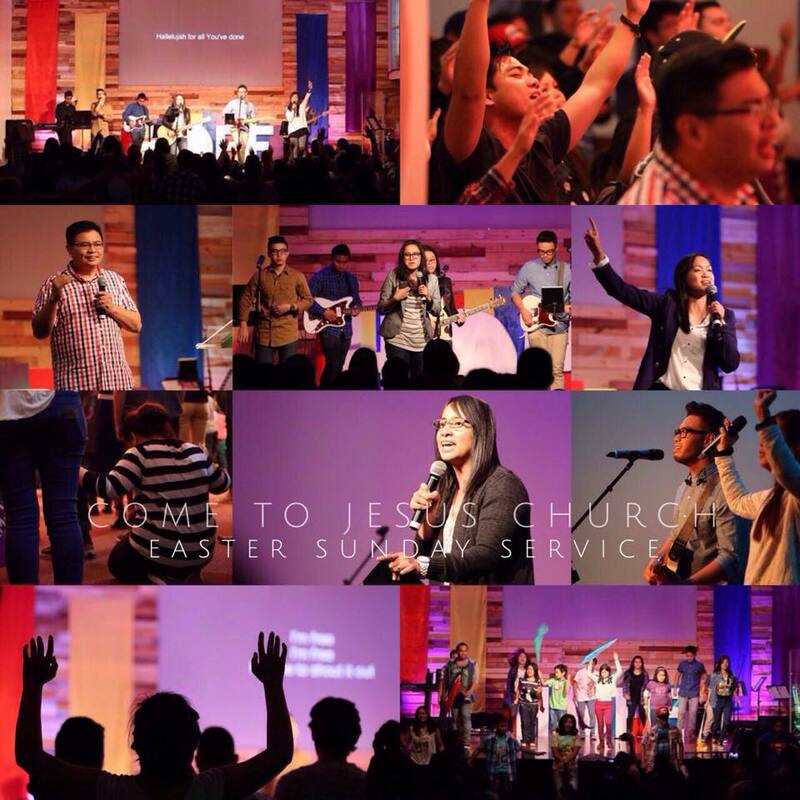 What an eventful Easter long weekend for CTJ Church! 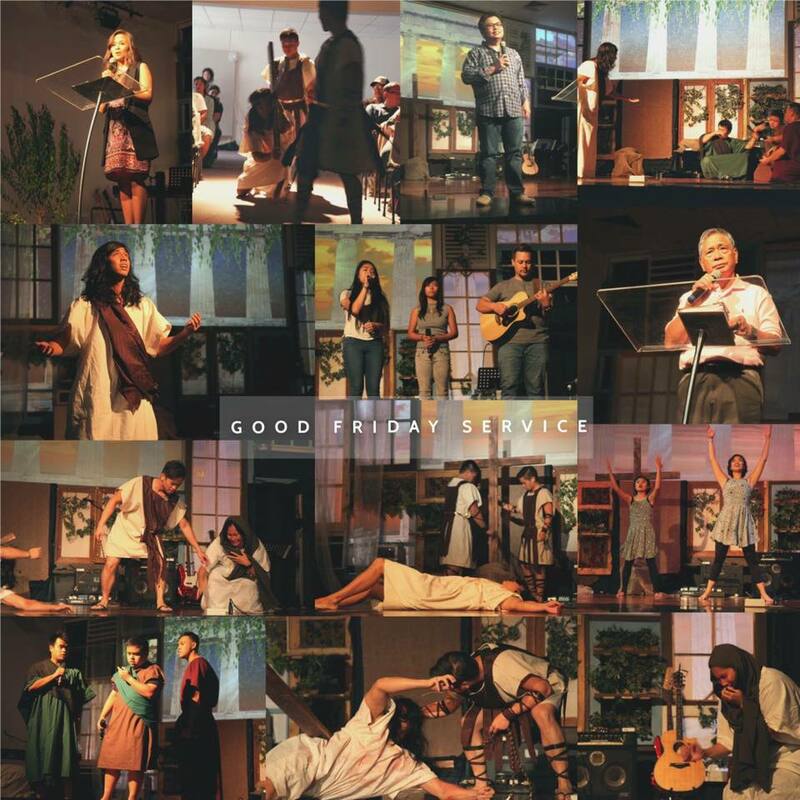 On Friday 18th April 2014, the Gospel story of Jesus was expressed by the Performing Arts ministry expressing the Birth, Life, Death and Burial of Jesus Christ followed by a Sunday morning service on 20th of April 2014 on the Resurrection. We celebrate together as a Church as Jesus has already won the battle over death! He is risen! 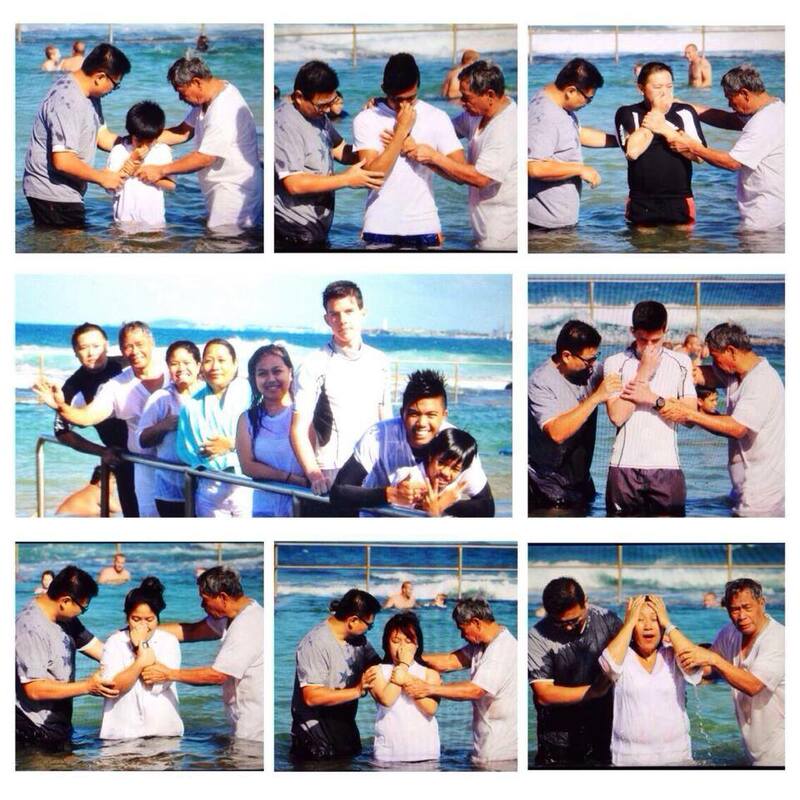 The Sunday service followed with a lunch fellowship and water baptisms at Towradgi Beach Park in Wollongong. Congratulations to all those who we were water baptized! 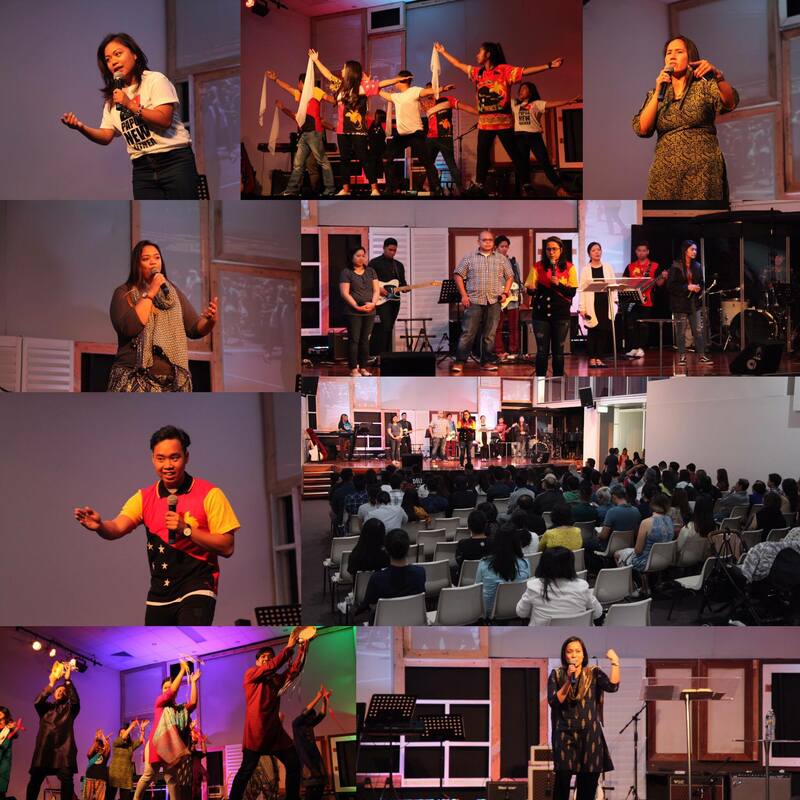 On 29 March 2014, CTJ had the opportunity to host a free Gospel Concert. The concert featured Tricia Amper Jimenez, Terry Javier and Jun Tuazon. CTJ was blessed with the talent and presence of these wonderful singers. Reverend Valerie Cantre & elder Nikki Aben arrived home to Sydney on 27th March 2014, after serving in the mission field of the Solomon Islands for a period of 11 months. We recognize their work and labour in serving the Gospel Light Church and their service to the Gospel Light Christian Academy School. They had graduated 8 boys from the Bible College and advanced 12 students to second year. 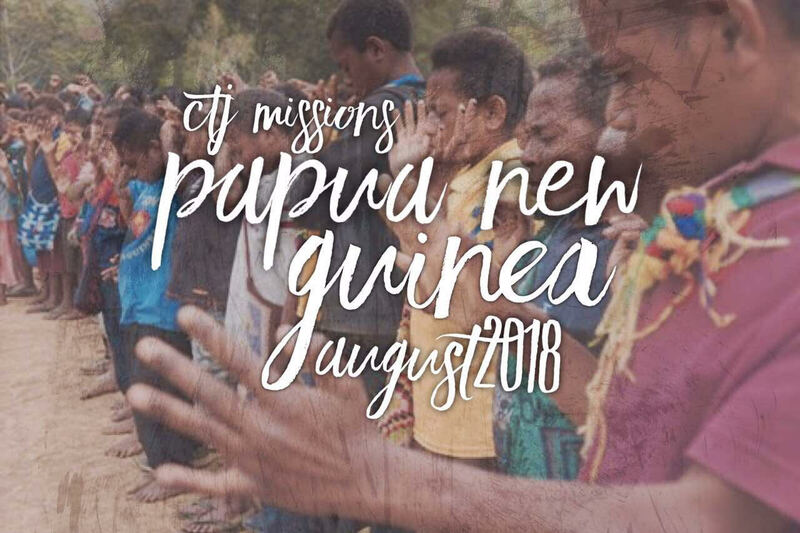 Upon their departure, two missionaries from PNG have arrived to assist the Church and a couple who are Solomon Islanders have returned from one year bible college and will look after the Bible School. Their other roles have been transitioned to various members of the Church. 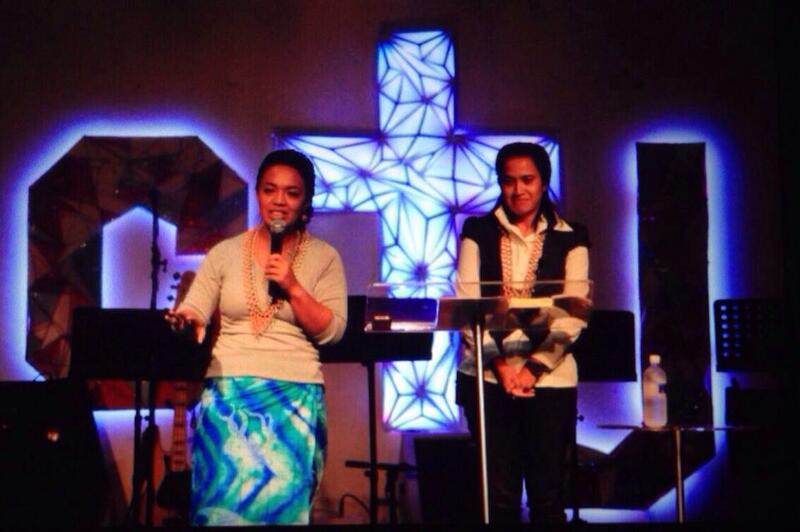 Welcome home Ps Valerie and Nikki! We thank you for laying down your lives to serve another nation for the sake of the gospel! 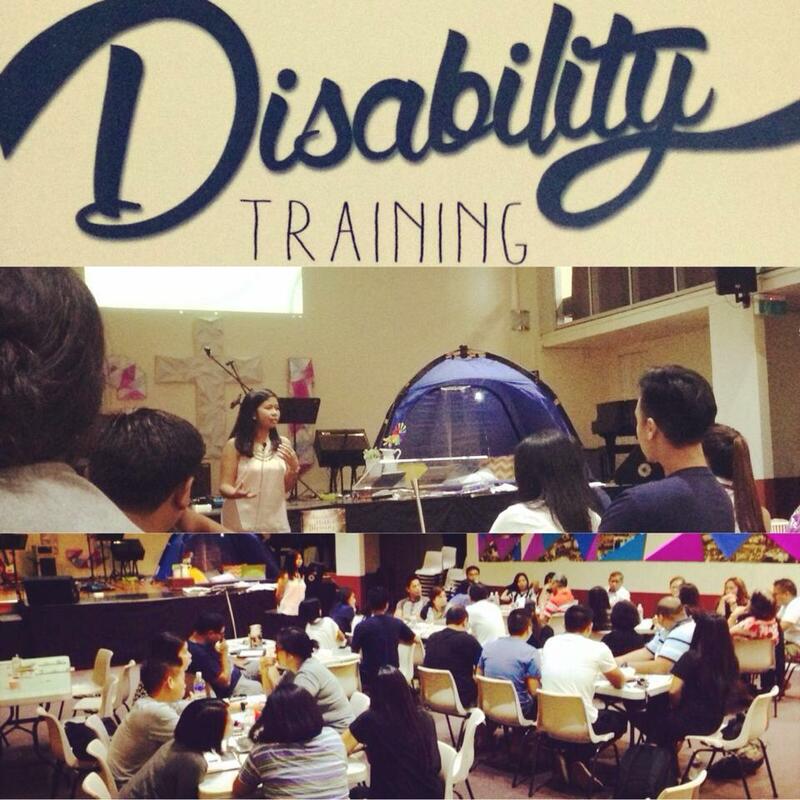 On Saturday 15 March 2014, CTJ leaders had the opportunity to be trained by leader, Nikki Aquiatan, in the area of Disabilities. Nikki currently works and has a degree in the field and is in the process of completing her Masters. 5. What "we" can do as a Church to cultivate an understanding and heart of acceptance for people with a disability. Nikki facilitated a discussion and activity for CTJ Church leaders to creatively "come up with a church disability initiative to serve, care, include and protect people with a disability in our community". We believe this is only the beginning of what God wants to do in this arena with CTJ Church! 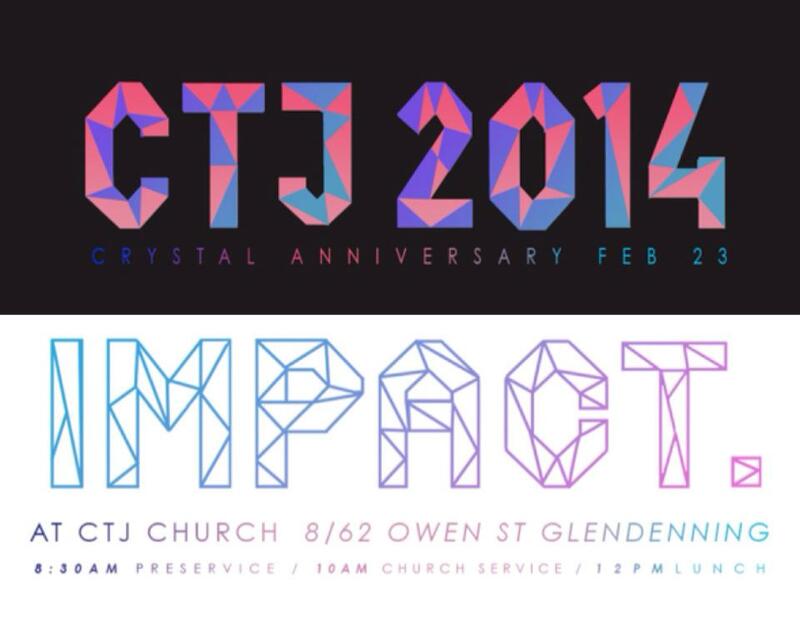 On Sunday 23 February 2014, we celebrated CTJ's 15th year anniversary. The morning began with free breakfast and a host of activities during pre-service. This included the famous apple eating competition, line dancing and a newspaper dancing competition just to name a few. 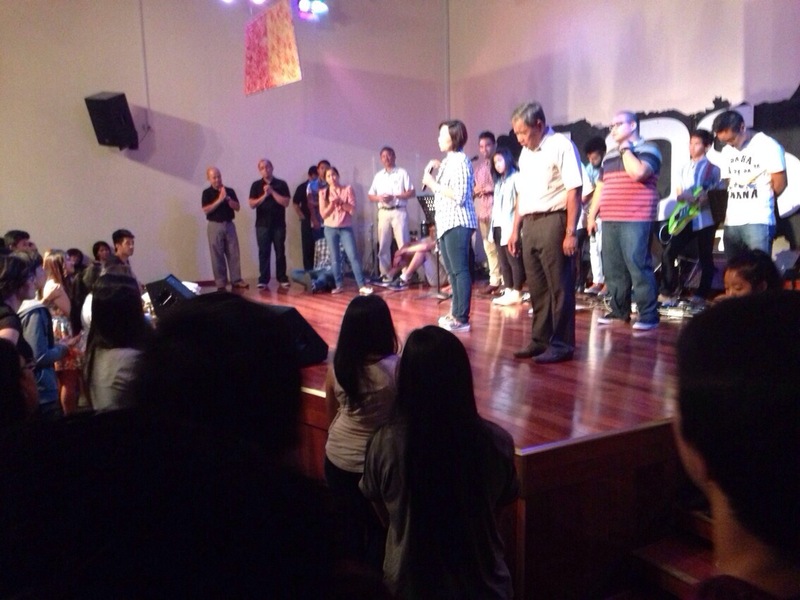 The program was followed by a 10am service in acknowledgment of God's faithfulness. A video was aired which showed a timeline of God's movement from our past buildings, which was showcased by the Performing Arts ministry. At the conclusion of the service, the church blessed our Senior Pastors with a thank you gift. Pastor Ding was thrilled to receive his new missions backpack so that he can use it for his upcoming trips. Free lunch was served after the service accompanied by a live band. At the end of it all, God gets the glory! We thank Him for the last 15 years of his goodness and faithfulness and we believe that there is so much more ahead for the church. 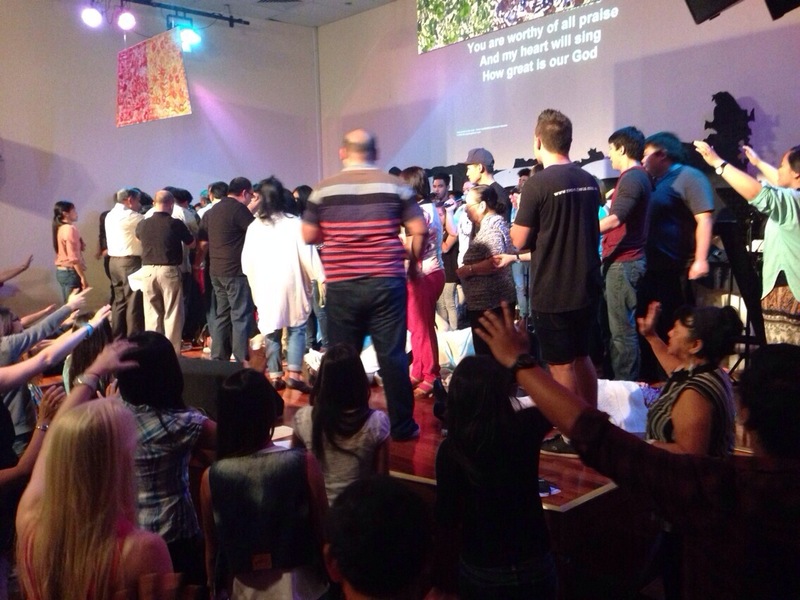 On Sunday 2 February 2014, the Holy Spirit filled our 10am service completely wiping off our usual program. We praise God for the miracles that took place, the breakthrough, the physical healing, the emotional restoration, the souls that have been moved and shaken and for the opportunity to be filled with His Holy Spirit. The morning became a worship service where the Church wholeheartedly sang up to 20 songs totalling up to more than three hours of worship. Many have testified of the Lord's powerful work over their lives and we glorify Him for all that He did that morning! We know He is not finished! 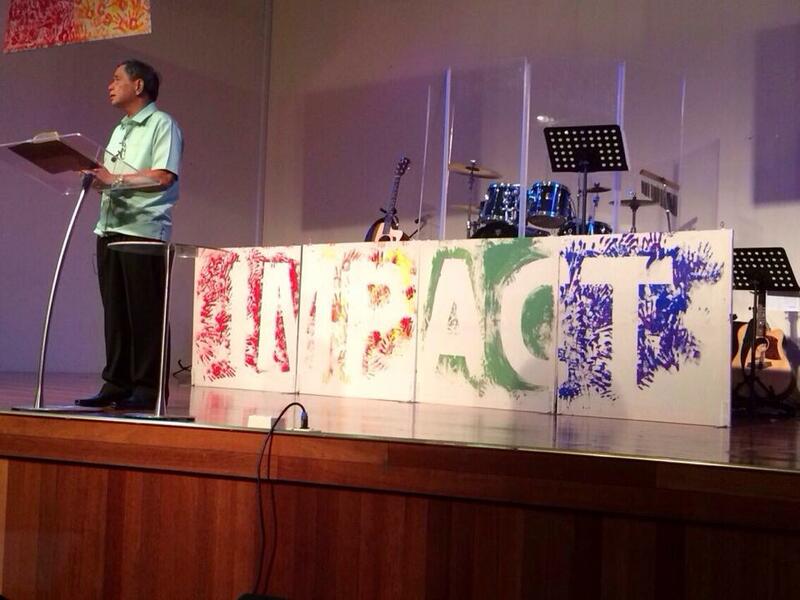 On 12 January 2014, our Senior Pastor, Ps Ding Cantre launched the theme for 2014. The theme is a significant launching pad for the year because it assists the Church in moving forward to a desired destination. This year, the theme will be "IMPACT". Pastor Ding shared a message on "The Impact of a flourishing Church" based on (1 Timothy 6:17-19) "Teach those who are rich in this world not to be proud and not to trust in their money, which is so unreliable. Their trust should be in God, who richly gives us all we need for our enjoyment. Tell them to use their money to do good. They should be rich in good works and generous to those in need, always being ready to share with others. By doing this they will be storing up their treasure as a good foundation for the future so that they may experience true life." Click here to read about our new theme. 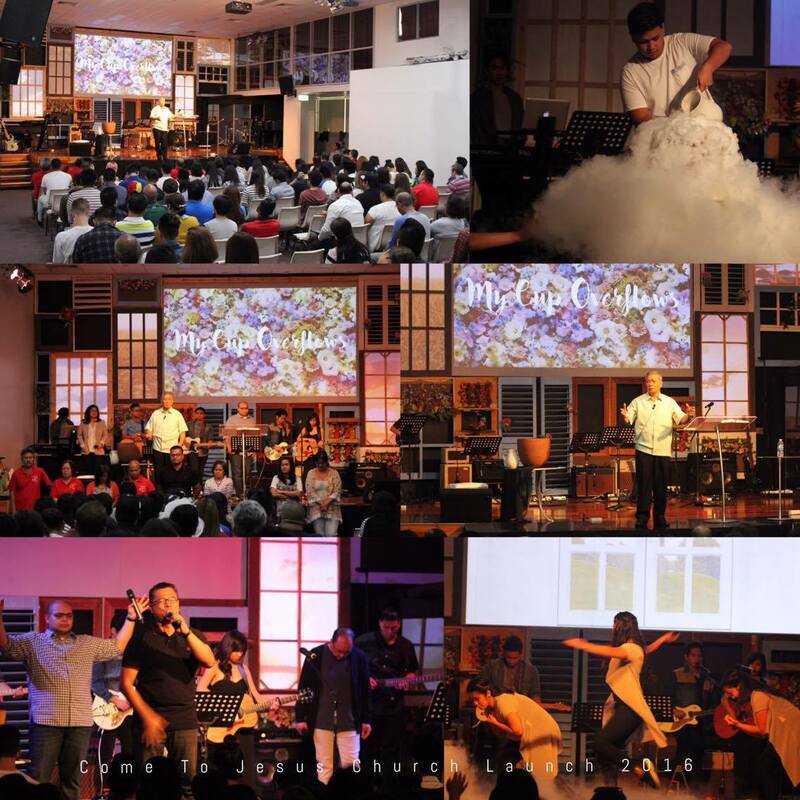 Our final CTJ Sunday service for 2013 was held on 29 December 2013. 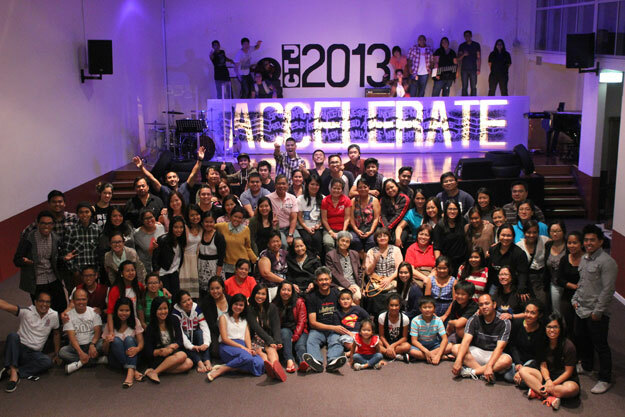 As we draw to a close for 2013, we would like to remind you to continue to accelerate and to RUN this race towards Jesus... Look neither to the left nor to the right, but press on towards the goal. Below are a few notes to remind you and help position you for 2014. WE WOULD LIKE TO WISH YOU A HAPPY NEW YEAR!!! We are excited for what the coming new year has to offer! Our CTJ launch will be on Sunday 12 January, 2014 where we will launch the next theme for the year! Watch this space for more updates! 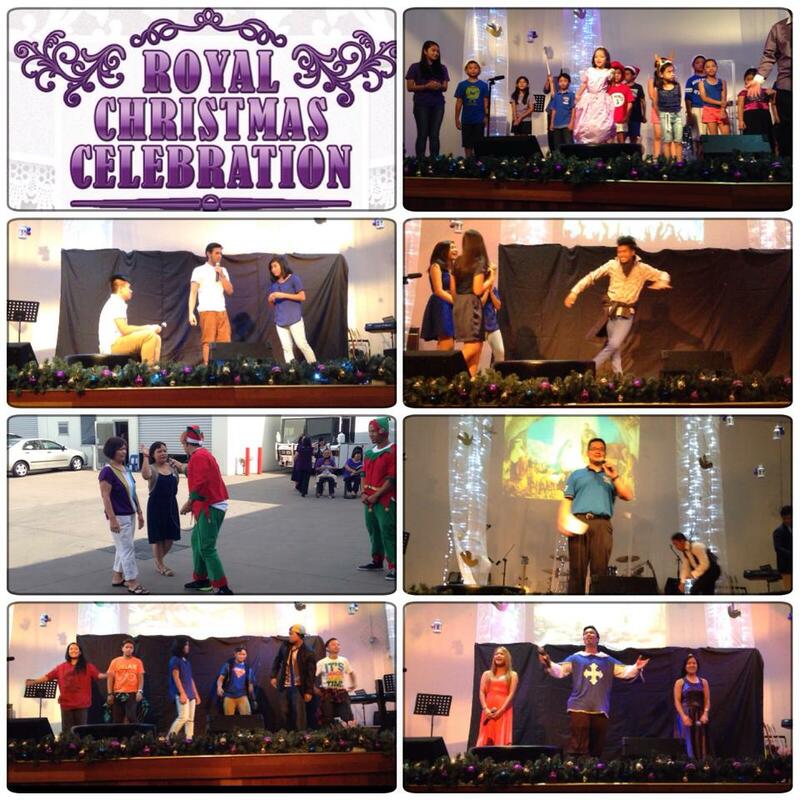 CTJ Church celebrated the birth of our Savior Jesus on Sunday 22 December with a Royal Christmas theme. 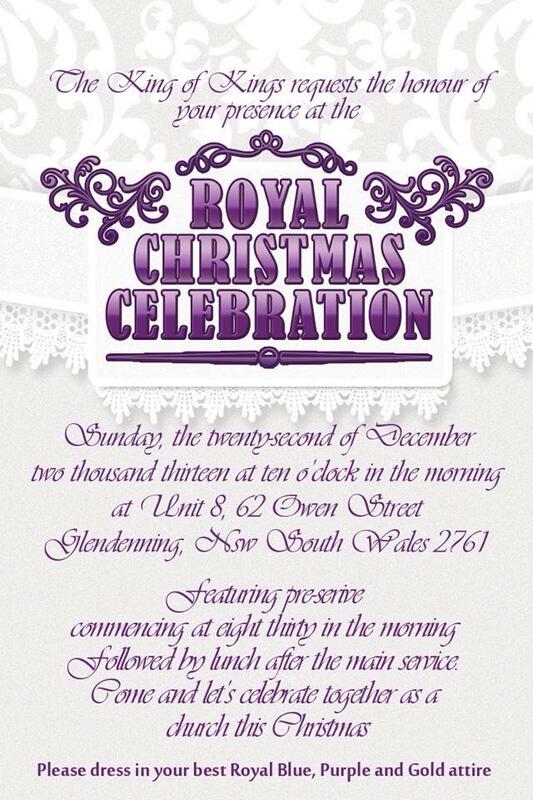 The service began at 8.30am with pre-service activities and breakfast followed by a 10am service. 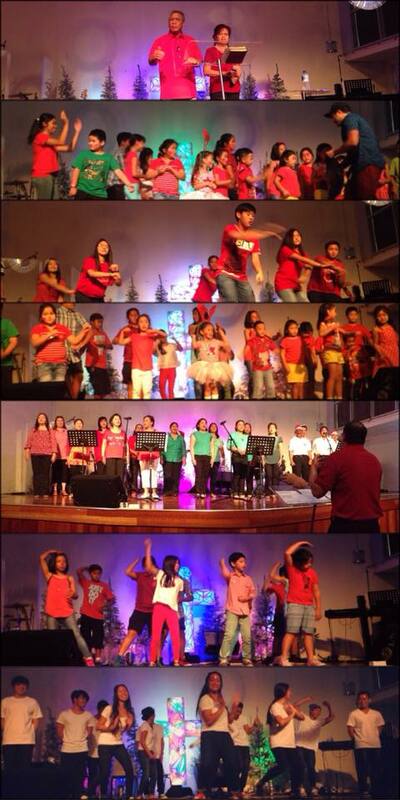 Kidsworld and our Performing Arts ministry took the platform to illustrate the meaning of the Prince of Peace followed by a word by Pastor Jim Yap. We pray you were blessed and enjoyed this service! Apart from the monetary donations & prayer, CTJ Church will also be donating non-perishable food. LBC has generously provided free cargo boxes for the shipping. With the URGENT & high demand for non-perishable food, we encourage you to please donate these specifically. 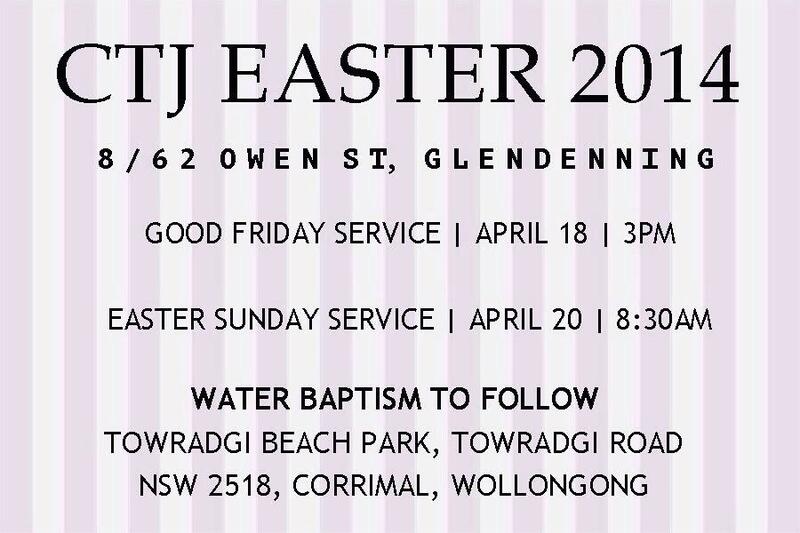 Please bring your non-perishable food to CTJ Church: Unit 8/62 Owen Street, Glendenning. From Thursday 14 November, LBC boxes will be placed outside CTJ Church and you may drop your items in the boxes provided throughout the day. 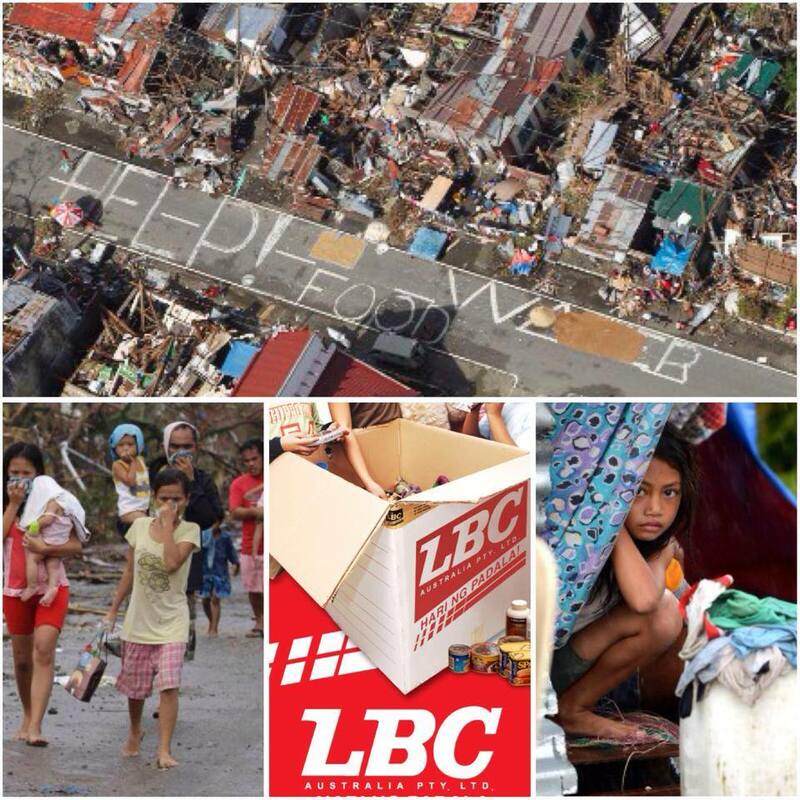 The photos (courtesy of CNN news - 11.12.13), displays the plea for help from the victims of the disaster. • Avoid giving noodles/food that require "water" to cook as water is scarce in the affected areas. • Please ensure all canned food has a ring pull on them. Most people don't have access to a can opener at this time. • Avoid donating clothes as there have been excessive amounts already collected. Please drop off your donations by 25 November 2013. WE TAKE THIS TIME TO THANK YOU FOR YOUR PRAYERS, SUPPORT, DONATIONS & FOR PROVIDING RELIEF TO WHERE IT IS NEEDED MOST! CTJ has collected monetary offerings on Sundays 10 and 17 November to be donated for the relief of the recent typhoon that has tragically hit Philippines on 8 November 2013. 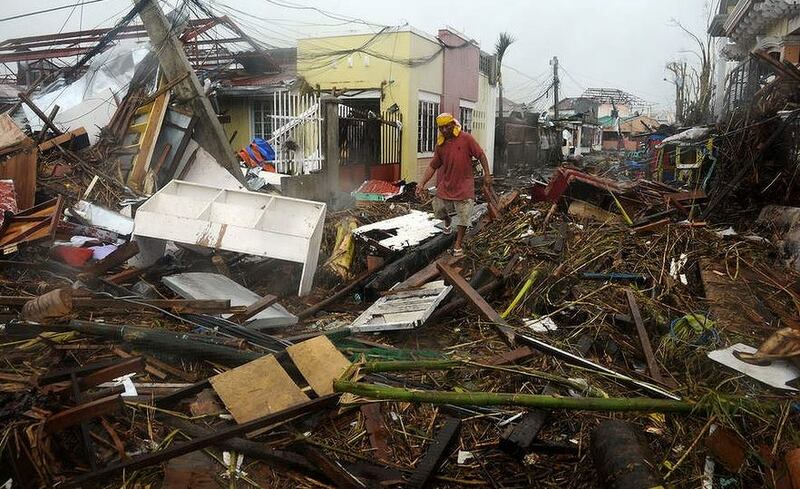 This is the worst typhoon in history to hit the nation with homes devastated and up to 10,000 people reported dead. We would like to thank everyone who has prayed and donated to help those in need. 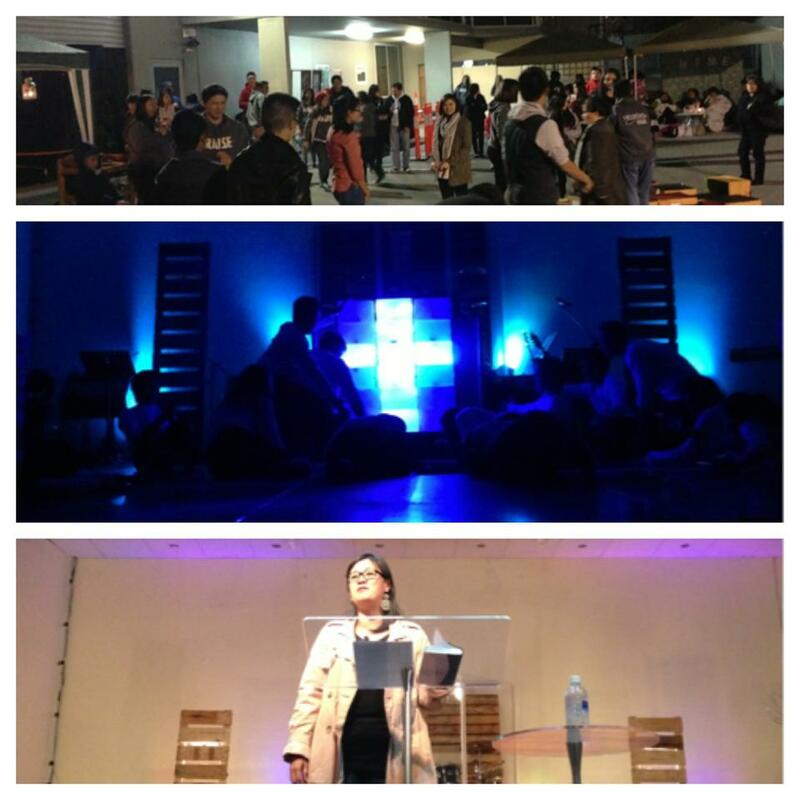 On Sunday 13th October 2013, the Men's ministry held a Prayer & Worship night for all men of CTJ. Men from 12 years old and above rallied together to worship the King of Kings and Lord of Lords and to corporately pray together. It was a spiritually refreshing night of worship; very different from the last Men's prayer & worship night held in March of this year where there was a loud outcry. We invite all men to continue to be involved in future Men's ministry activities for the purpose of building, reaching and equipping this generation of men. On Saturday 12 October 2013, nine attendees completed Class 101 and four members progressed to complete Class 201. Class 101 is the basic introduction to our CTJ church family. This class was designed to clearly explain who and what our church is. It is the prerequisite before completing Class 201 and before serving in any ministry. 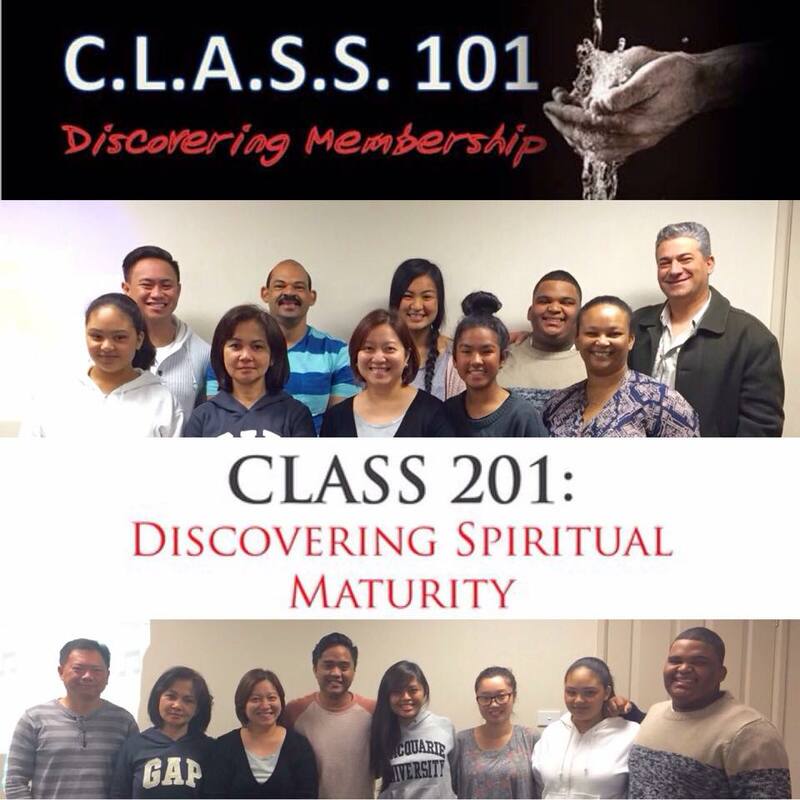 Class 201 is the second of CTJ’s four basic classes and is about spiritual maturity. These classes are held each year for new believers and members who would like to mature in the faith. Class 301: "Ministry covenant" and Class 401: "Missions covenant" will be coming soon. 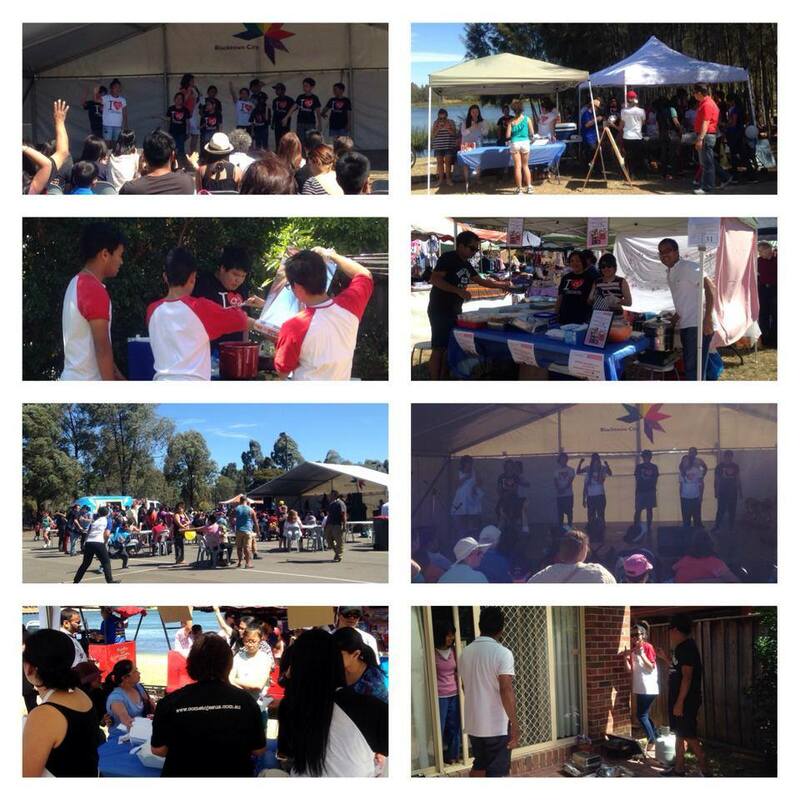 On Saturday 28 September, CTJ participated in the local Woodcroft Festival. 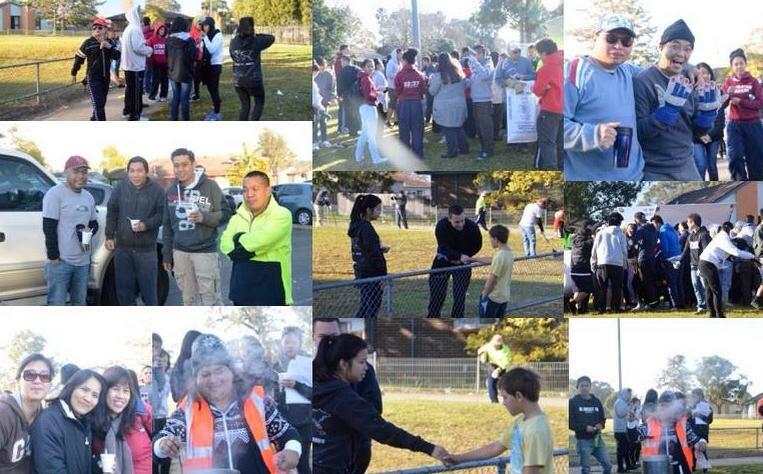 The event is a Blacktown Community initiative which took place from 10am - 4pm by the Woodcroft Lake. CTJ had various stalls to fundraise for Missions, RAISE (young adults) and GFRESH (youth). It was the first time our Kidsworld ministry had the opportunity to perform for the community by doing a hip hop dance. 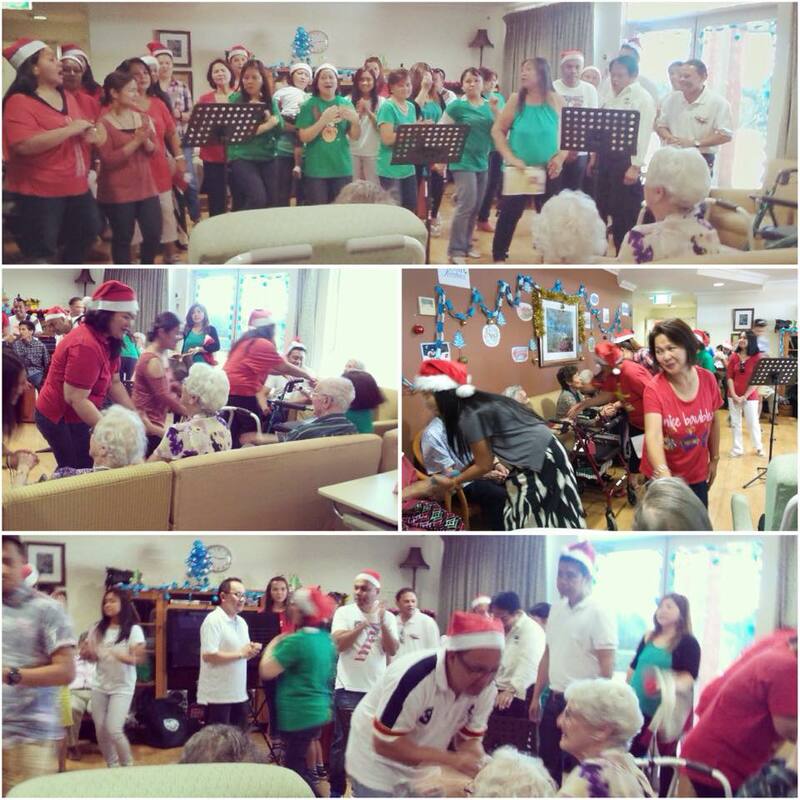 The GFRESH dance ministry also performed a dance later in the afternoon. We would like to take this opportunity to thank you for serving and supporting CTJ during the day. 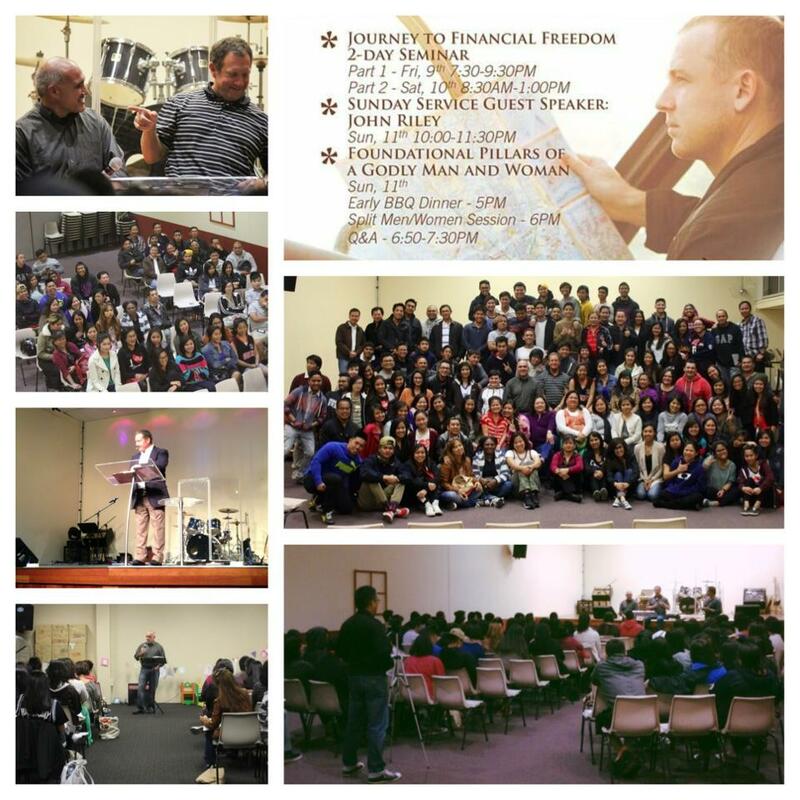 Crown Financial Ministries had the opportunity to visit CTJ from Friday 9 August to Sunday 11 August to host the "Journey to Financial Freedom" seminar and various other services & sessions throughout the weekend. This is the first seminar held by Crown Financial Ministries in the southern hemisphere and what a privilege for CTJ Church to host such an event! The Financial seminar had up to 200 registrants including CTJ members and guests. 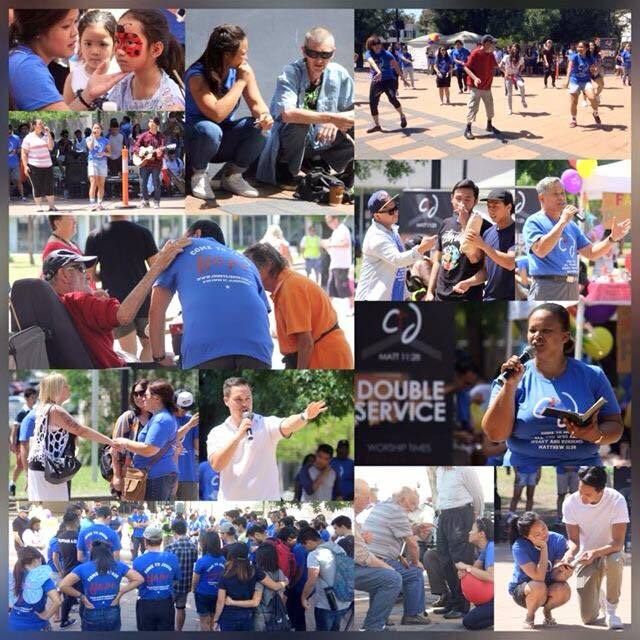 We praise God that more than 30 people received the Lord Jesus as their personal Lord & Saviour. We have also received many testimonials of changed mindsets and hearts towards finances. The "Fundamental Pillars of a godly man and woman seminar" took place on Sunday 11 August with over 100 registrants. The men and women had split sessions with Pastor John speaking to the men and Pastor Phil sharing with the woman. The evening concluded with a joint interactive Question & Answer forum. We would like to take this opportunity to thank Pastors John Riley and Phil Labarbera for their service, time and for sharing their wisdom with CTJ Church. 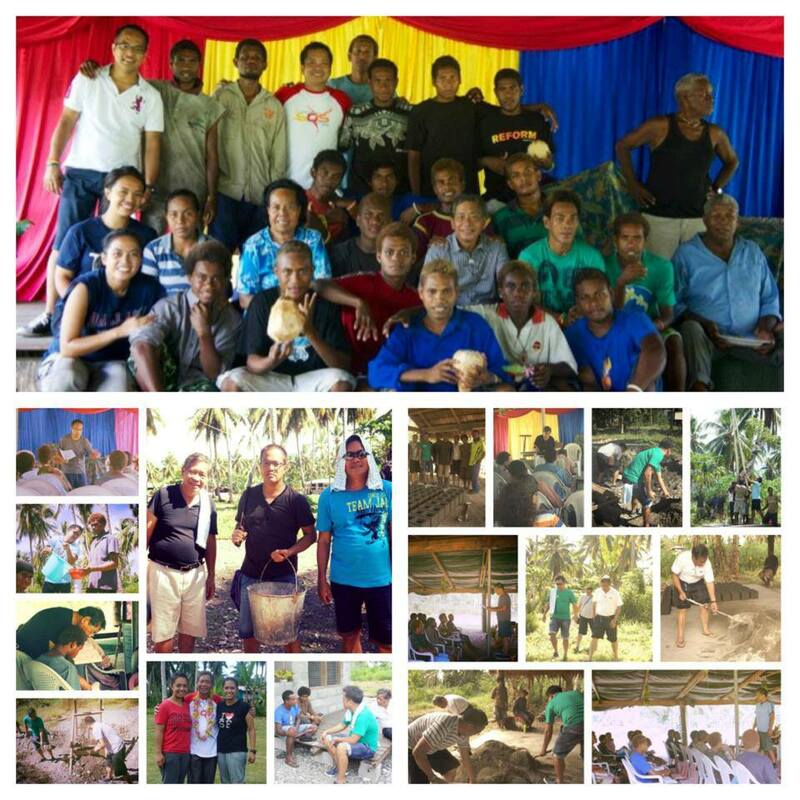 Our 3 missionaries have returned from their visit to the Solomon Islands on Tuesday 30 July - Thursday 8 August, 2013. Pastor Ding, Brother Jun and brother Jimbo are back with many stories and testimonies to share from the nation. The three men had spent time ministering to the people in Solomon Islands, assisted in building and labour, taught sessions at the bible college and served the needs of the church in different areas. 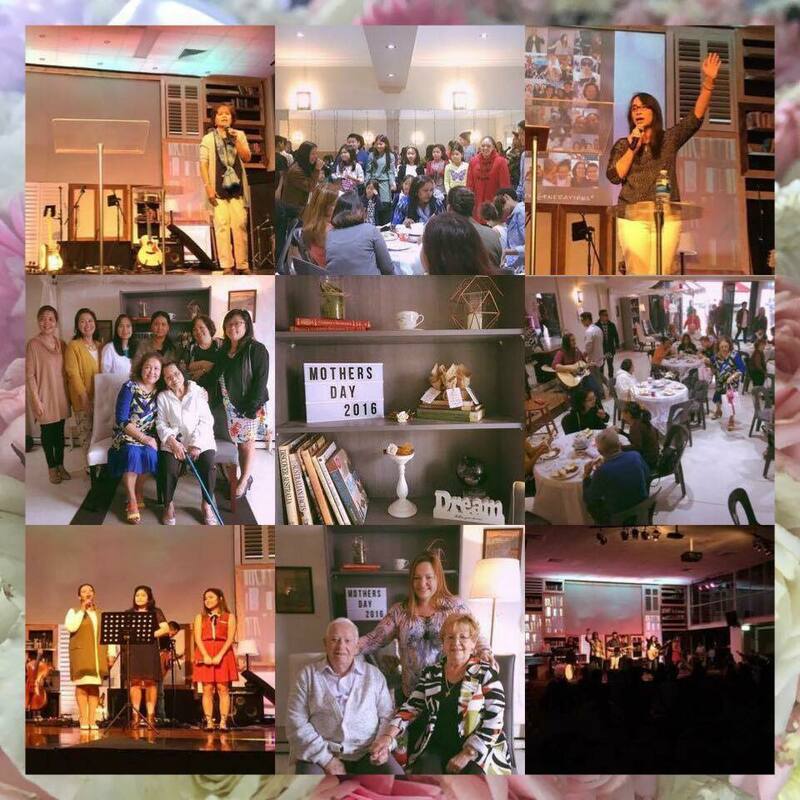 Valerie Cantre, SI missionary says, "We appreciate having a church family CTJ that not only support us on the mission field by their prayers, finances but also by their presence travelling all the way to be with us. Your donation towards the water well have started and in the process on being completed, the Kindergarten School opened on 4th Aug.. from us to you all, we want to extend our THANK YOU! May Gods kingdom be accelerated in Solomon Islands!" 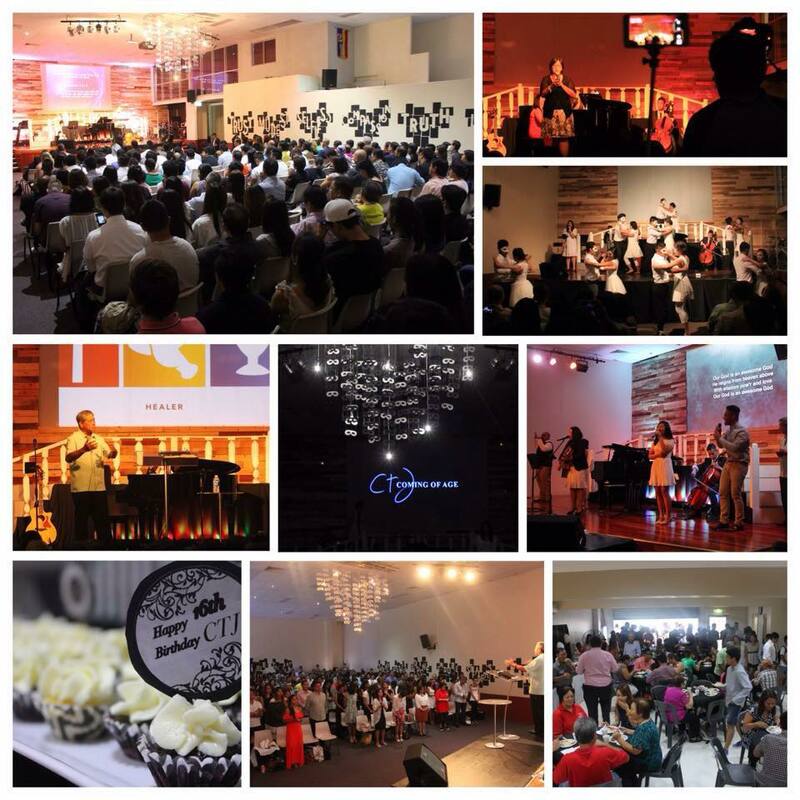 CTJ Church celebrated our annual Thanksgiving weekend on July 26-28. 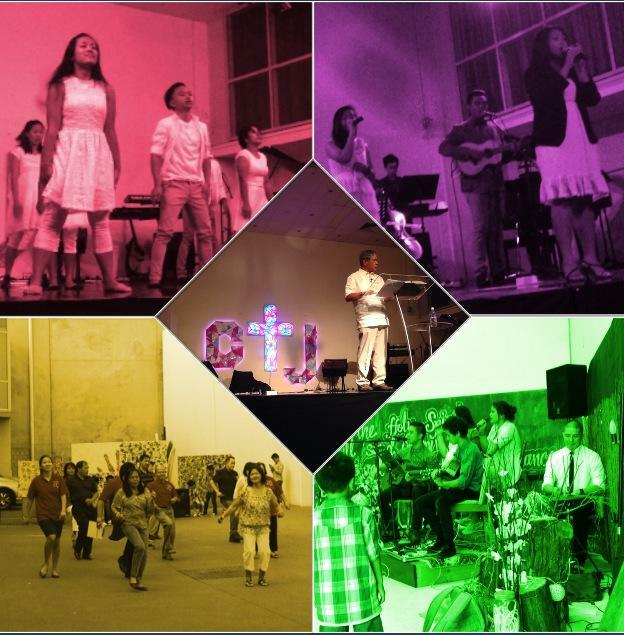 The opening service began on Friday 26 July with an evening of pre-service snacks and activities hosted by our Young Adults ministry followed by an opening performance by the Performing Art Ministry. Pastor Rodel presented the renovation proposals for our Church HOME and concluded by Pastor Rita preaching a powerful word on breaking down the walls. On Saturday July 27, our Community Impact ministry organised for the Church to clean up a local park in Shalvey and remove graffiti as a way of loving on our COMMUNITY. 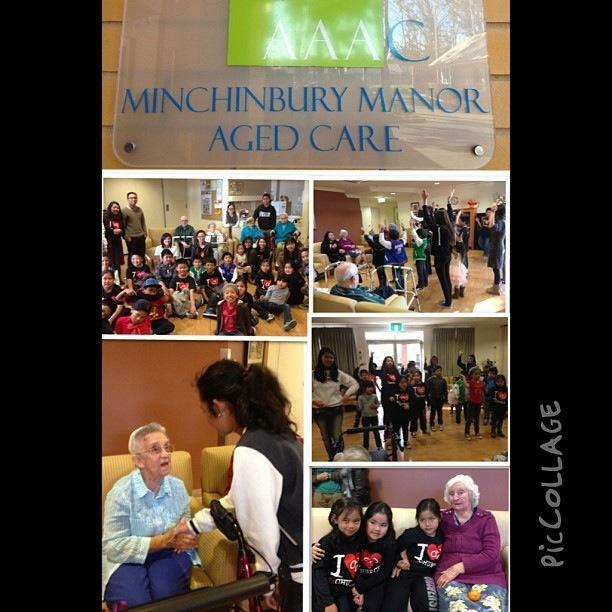 Our Kidsworld Ministry also participated by serving Doonside Nursing home and Minchinbury Manor Aged Care. 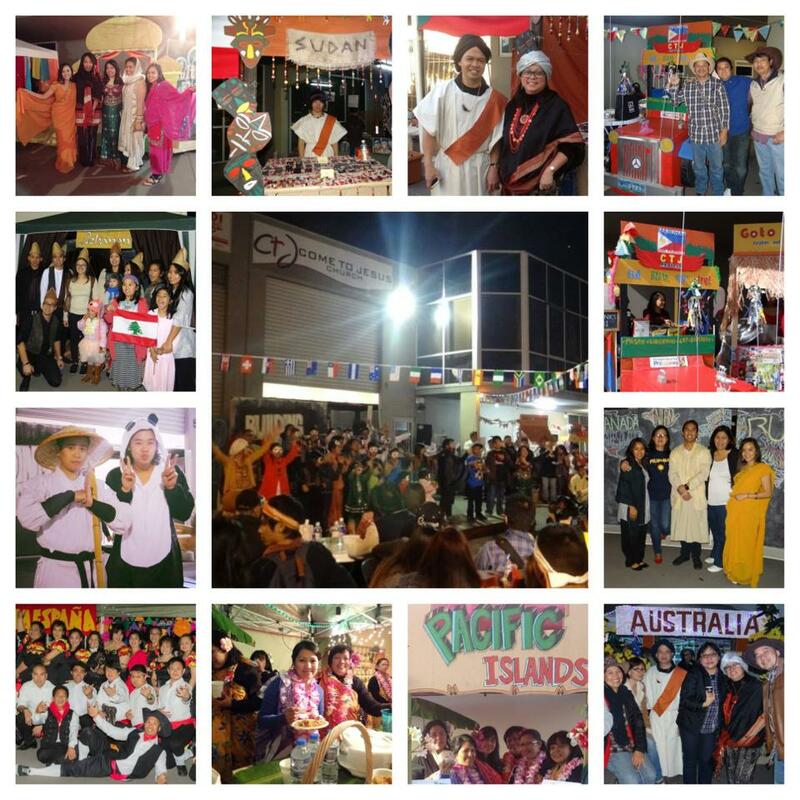 From 4PM onwards, the Church held a Culture Fest and came together to present, explore and reach the different NATIONS in our community: Sudanese, Filipinos, Lebanese, Indians, Chinese, Spanish, Pacific Islanders, Australians and Aborigines. The night consisted of an international food stall, performances, raffles, prizes, a fashion parade and plenty of entertainment. On Sunday July 28, CTJ held the final Thanksgiving service. It started with Raise hosting pre-service breakfast/lunch & games, a sermon on building God's Kingdom teaching by our Senior Pastor Ding, a prayer to release our three upcoming Solomon Islands male missionaries, publicly honouring and thanking our Senior Pastors, a closing dance by the PAM ministry, a radical praise pit, free Japanese lunch cooked by the Food ministry and a whole lot more fun, fellowship and dancing. Building His Kingdom doesn't end here... God's heart is for the nations! Let us continue to be the light in our community and the world around us! 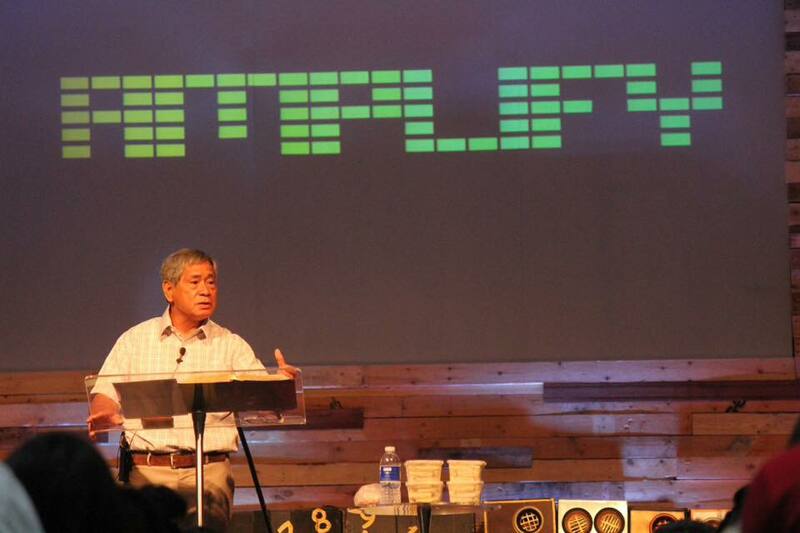 Yesterday, Pastor Rodel shared a heartfelt message on "Serving The Master". Everyone was given an opportunity to check out the different ministries at the end of the service. 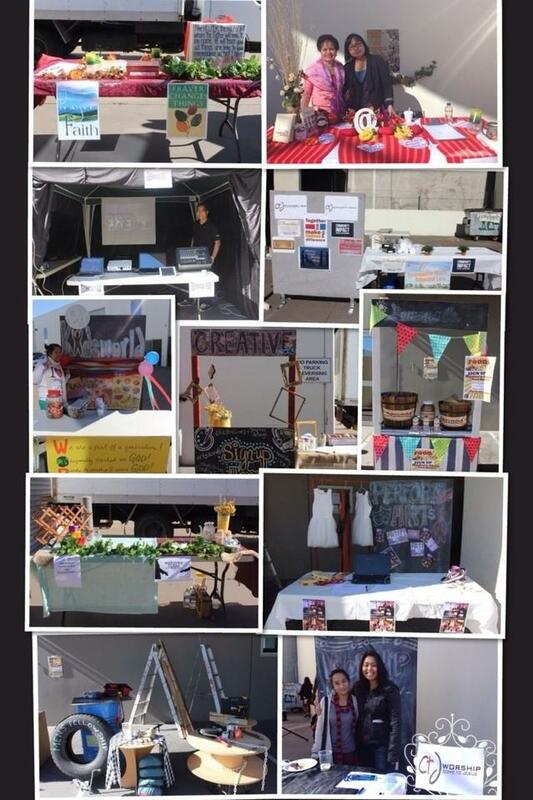 Did you get to check out the different ministry booths? If you didn't get to sign up yesterday, it's not too late to get involved in a ministry today! We hope you take the time to consider and pray about signing up for a ministry. There is such a joy in serving. It doesn't matter if you don't have the skill for it, the heart to serve is what matters most. As Pastor Rodel said yesterday, "The reward for serving God, is serving God!" Email: info@cometojesus.com.au if you are interested in serving. The men of CTJ have arrived back from their weekend camp, which took place on Friday 17 May - Sunday 19 May at Crosslands Youth & Convention Centre. The camp theme was called "Equip & Empower", which had over 60 registrants. 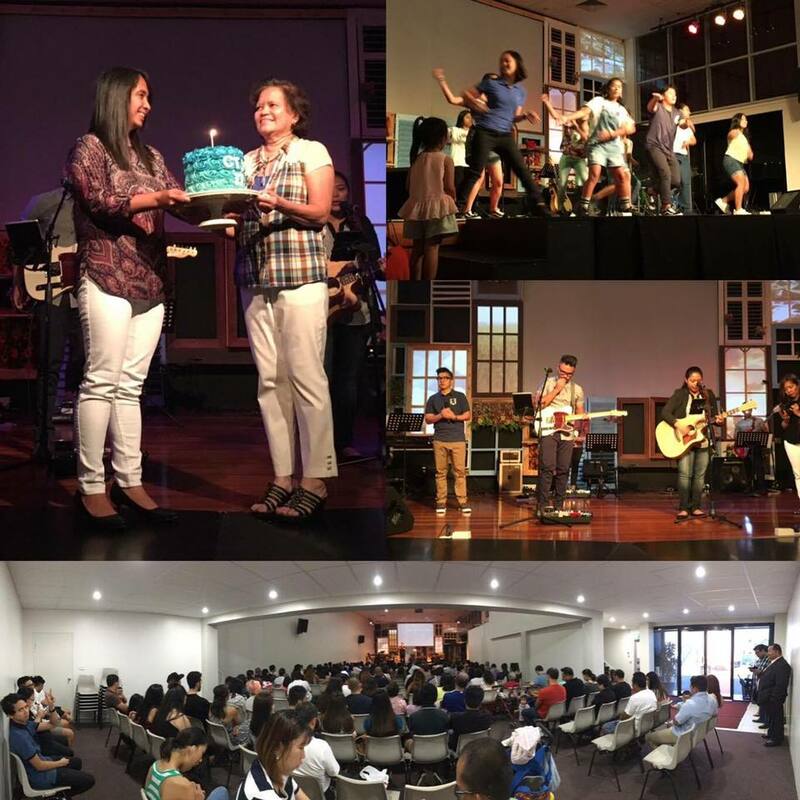 The weekend involved worship, fellowship, teaching sessions from guest speaker Pastor Dong and various team building activities. The final evening of the camp consisted the men on their knees crying out to the Lord during a time of worship. Many of the men have returned to testify that the camp was "a life changing event". 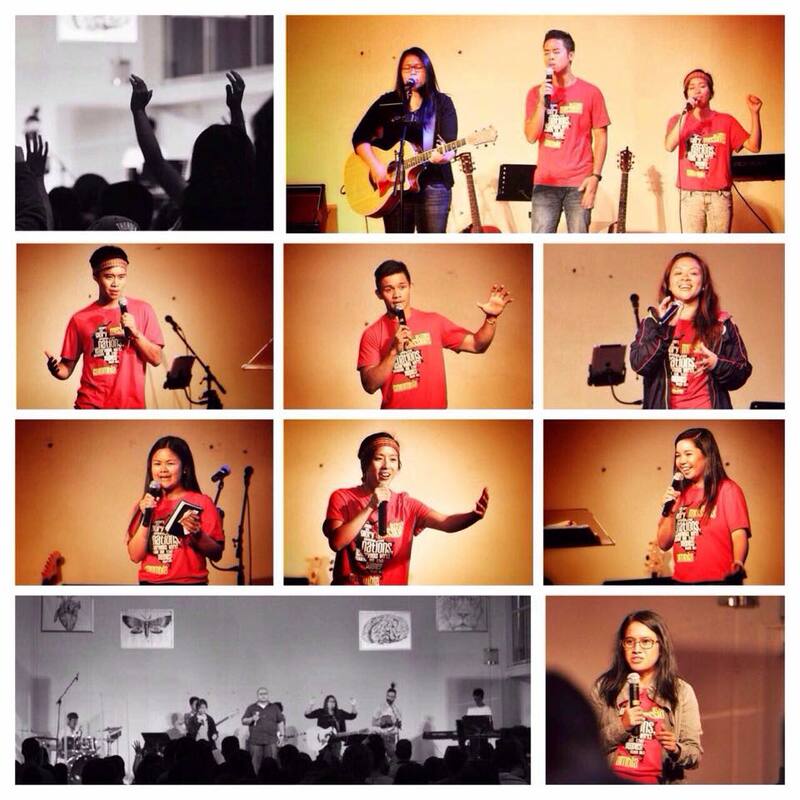 GFRESH youth news: SOS camp is coming this 2014!!! 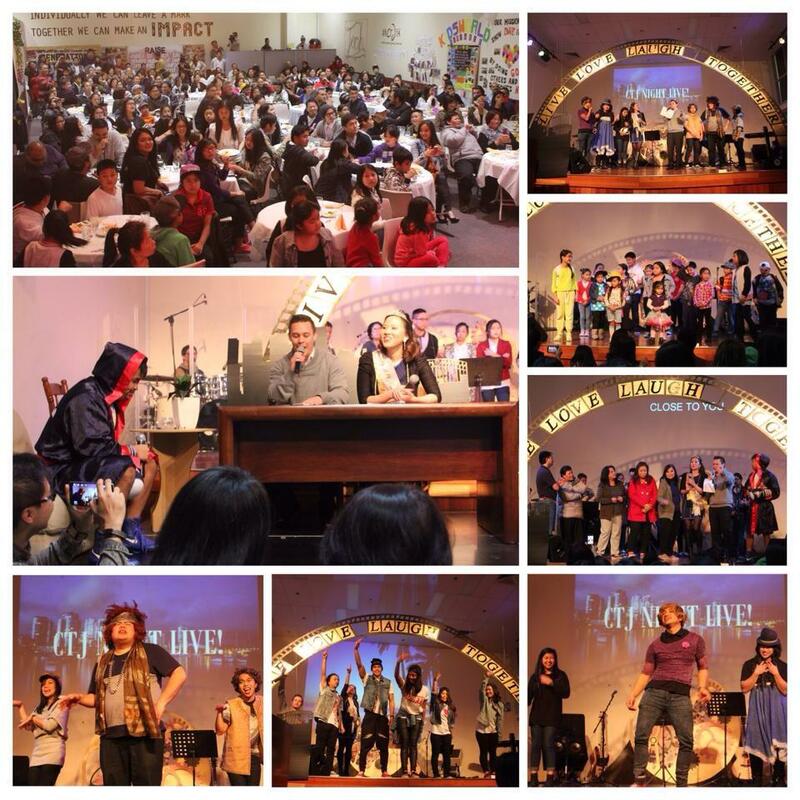 The big reveal took place at Generation FRESH youth lastnight on May 3, 2013. Word is on the street that SOS camp is coming this 2014! Register now! 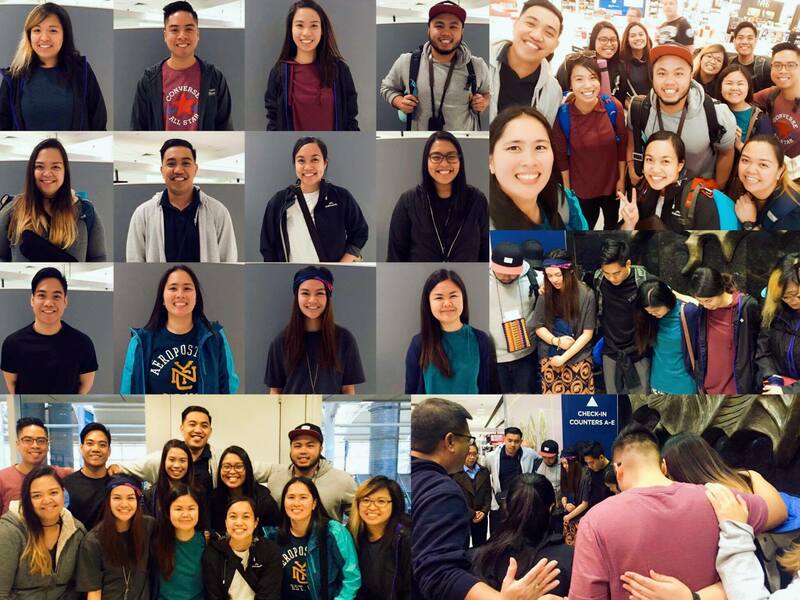 This morning CTJ sent off our first long-term missionaries. Reverend Valerie Cantre & elder Nikki Aben departed Sydney airport on 23 April 2013 to serve the mission field of the Solomon Islands for a 12 month period. Last week, they were given Missionary credentials by Foursquare denomination recognising them as missionaries. Please partner with us in supporting our missionaries through prayer and giving. If you would like to support them on this journey, faith pledges and donations are collected each Sunday (in a yellow envelope). 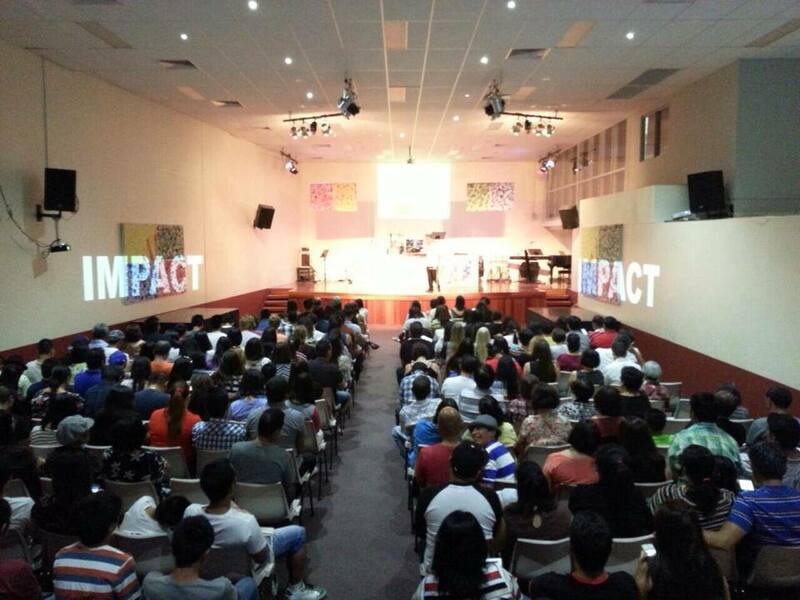 If you would like to EFT, please send an email to info@cometojesus.com.au and we will forward you the details. The door for MISSIONS OPENS this 2014 as we send off 3 mission teams next year!!! On 13 March 2013, Wednesday evening, CTJ Church had the privilege to hear from speaker Dr Rob Carman, founder of Victory World Missions (USA). Dr Carman mobilised the Church on the topic of missions. He challenged members to do more than just receive, but to give out. He said if all we do is congregate here at Church, we will never satisfy our appetite. If you want to know how Jesus fulfilled his appetite, it wasn't by getting, but by giving. "When the Church ceases to impact the world, it is meaningless," said Dr Rob Carman. At the end of the service, CTJ members had the opportunity to make a Faith Promise. A Faith Promise in the words of Dr Carman goes beyond a pledge. It was an opportunity to make an impact for world missions. One way is through prayer and the other is by giving financially to the missionaries we are releasing to the Solomon Islands. If you missed out on Wednesday and would like to commit to make a Faith Promise to the Solomon Islands, there will be labelled yellow envelopes at the CTJ Bookstore every Sunday. You may place your donation in this envelope and drop it in the tithes and offering basket during the service. If you would like to make a one-off donation through EFT, please email: info@cometojesus.com.au and we would be happy to forward you the CTJ Solomon Islands account details. The Kidsworld parent/team meeting took place with lunch and fellowship followed by a brief presentation. The newly appointed Kidsworld Director Jasmene Comafay shared the vision and heart of the children's ministry at the event. Jasmene says, "Kidsworld is excited to partner with our Senior Pastor to see God's vision come to pass, but most especially with the parents in imparting the heart of God into the lives of their children...By God's grace Kidsworld is accelerating and going to be a part of the big picture!" Later in the evening, over 40 men gathered at 7pm for Father's Prayer & Worship. 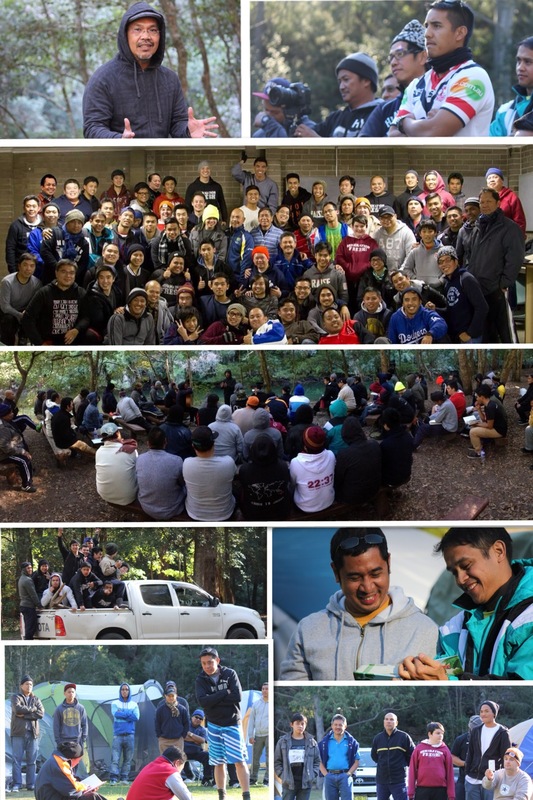 CTJ Men's ministry co-ordinator Edgar Delacruz says, "One thing I know is God is stirring up the hearts of men into a new horizon where Christ is centred in the lives and family of each individual. It was a night of repentance and cleansing. The worship was amazing...I felt like I was in another dimension". The event is the beginning of many more for the Men's fellowship! CTJ Church celebrated its 14th Anniversary yesterday. It came with preparation and hard work behind the scenes from different ministries. The Events & Creative Arts team was present throughout the week decorating the stage and walls. Volunteer men for the event also built an extended stage. The Anniversary celebration started at 9am with pre-service activities, free breakfast and a photo booth. The entire church came in uniform wearing their recently purchased "I love my Church" shirts. The 10am service began with a spectacular welcome with helium balloons, praise & worship and an opening dance by the Performing Arts ministry to the song "Home", which was followed by a biblical message by Pastor Ding on "I LOVE MY CHURCH" based on Matthew 16:13-18. The builder and foundation is solid and firm (Matthew 16:18). Every day is a gift to look forward to (John 4:35). It is a home and I can express God's love that was deposited into my life. "The highest expression of my love for the Church is to pray for it", says Senior Pastor, Ding Cantre. The Church was unable to seat all guests at the beginning of the service due to the overflow of attendees, but the problem was easily fixed when the youth willingly gave their seats to the adults. Events co-ordinator, Rita Delacruz, says "It's a great problem to have". One youth attendee, Laura Gonzales said, "What I loved was how well we all came together as a family." The service concluded with fellowship, free lunch and dessert organised by the adult connexion groups. The promo for our 14th year Church anniversary! After church service on Sunday February 3, CTJ held their Annual General Meeting (AGM) at 1.30pm. The AGM concluded with anointing and prayer over all the new staff, workers and ministry leaders. CTJ church celebrated our annual family day at Bents Basin on Saturday 26th January from 9am-6pm. The event consisted of a picnic at the reserve followed by swimming in the basin and a water baptism. Six CTJ members have made a decision to publicly declare their faith and be identified with Jesus Christ through water baptism. We were blessed with beautiful weather, good food and great family time. 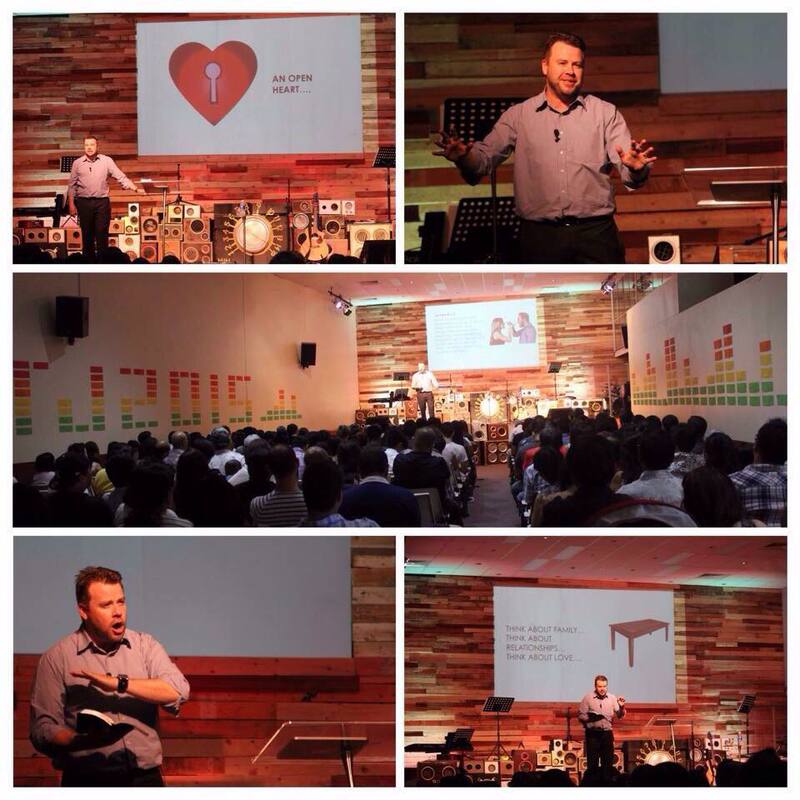 CTJ was blessed to have guest speaker Pastor Jaycee Jennings at our Sunday service on 20th January. 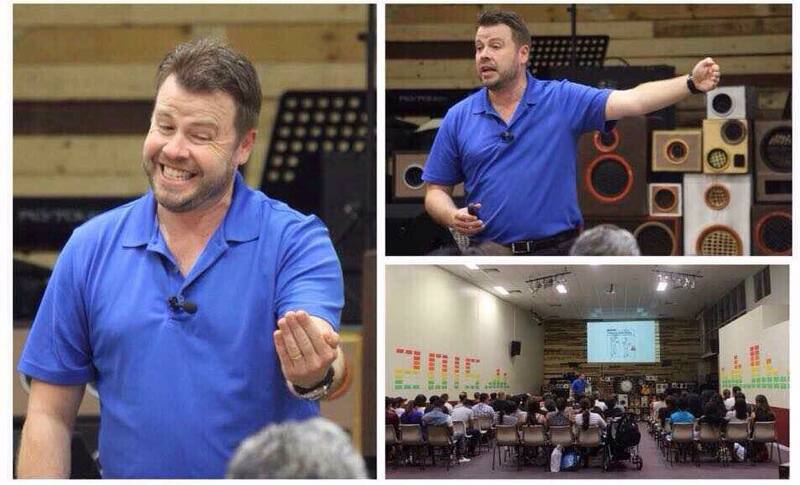 Pastor Jaycee Jennings is from Dallas, Texas USA and is the director of Youth For the Nations. He shared a message entitled, "Unforgettable" which ministered to the church family, but spoke directly to the father's of CTJ to rise up. Many families were transformed and reconciled after the service. On 20th January, up to eight children from Kidsworld (Children's ministry) graduated Sunday School. The kids were acknowledged in the service alongside their parents in a graduation and to transition them into the Youth Ministry of the church. They will now be attending Generation FRESH youth where they will continue their spiritual journey with God and with other teenagers. The CTJ corporate fast has come to an end on January 13, 2013. The church fast began on January 7th to deny the flesh and in a bid to get more of God. The fast was a Daniel Fast, which included abstaining from meat and consuming a diet of fruit and vegetables. 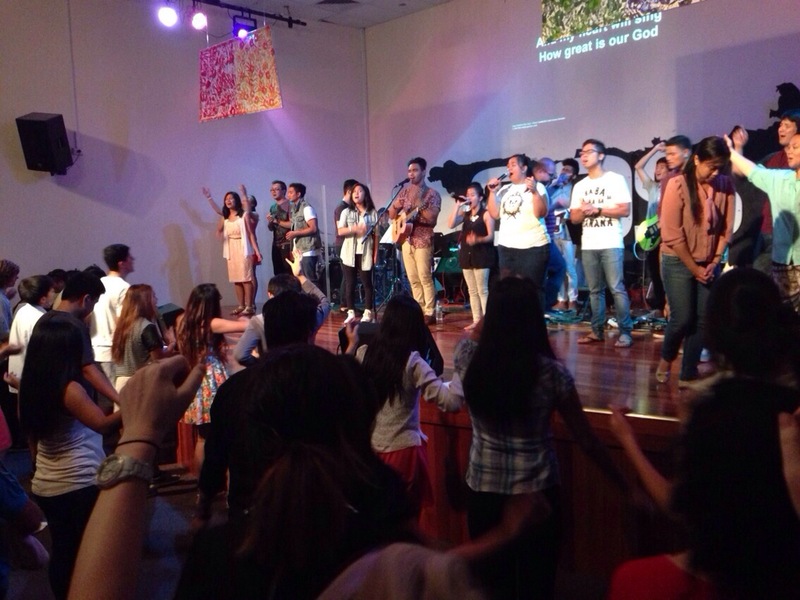 The fast ended after seven days with a final prayer service held at the CTJ centre.